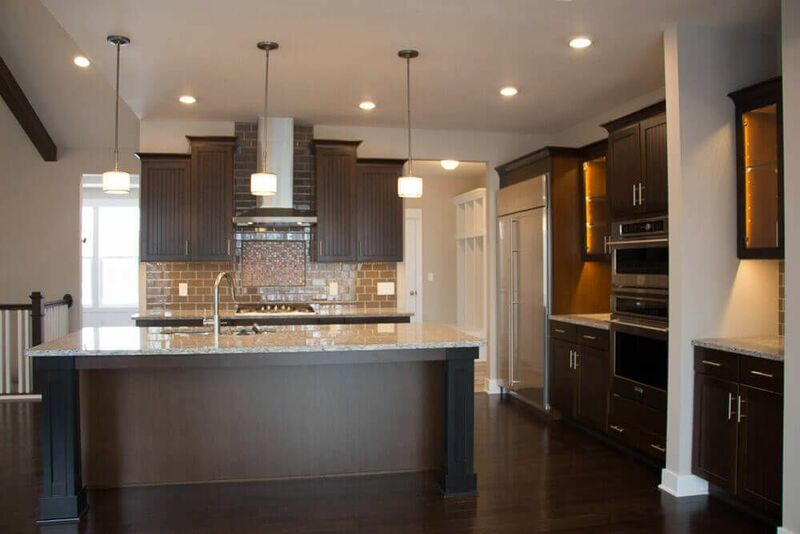 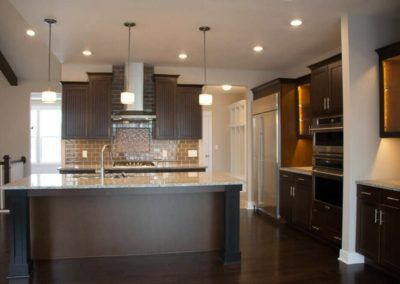 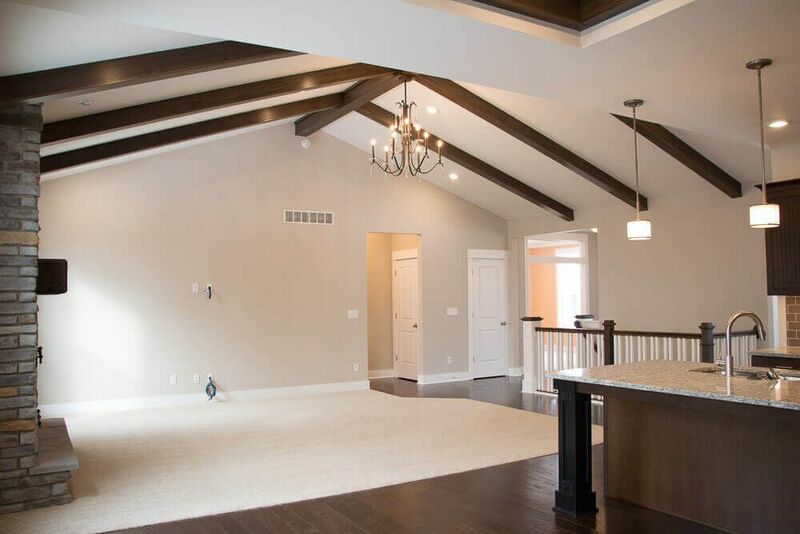 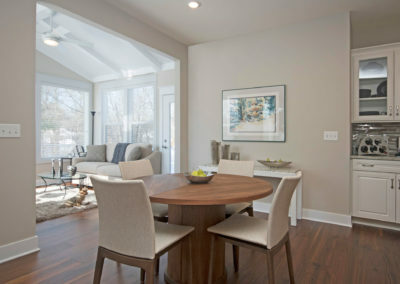 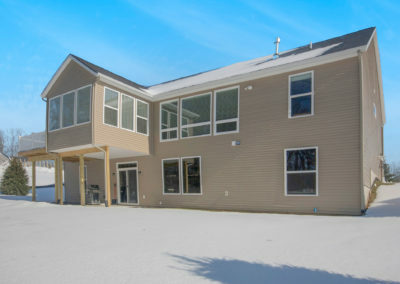 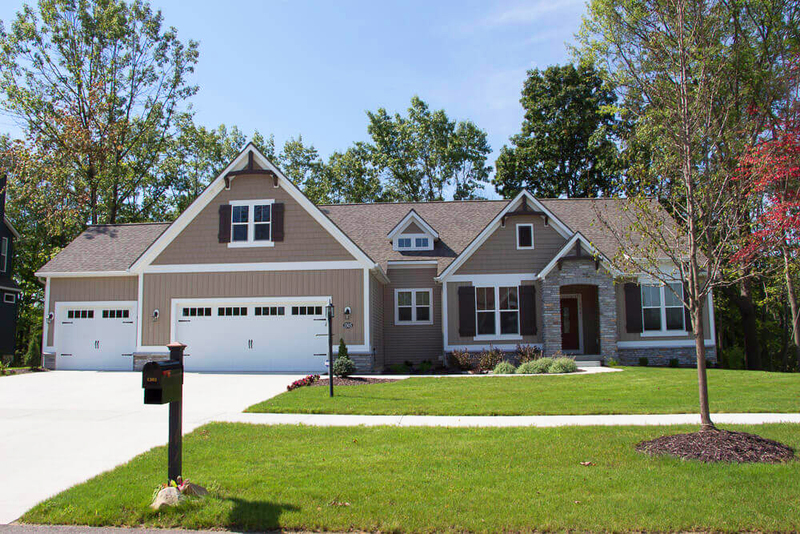 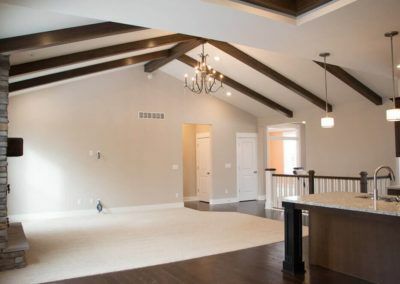 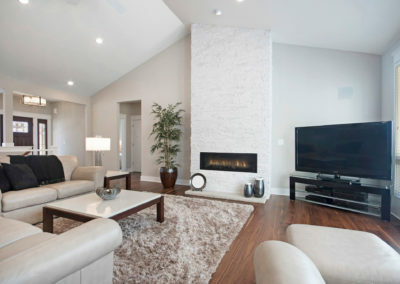 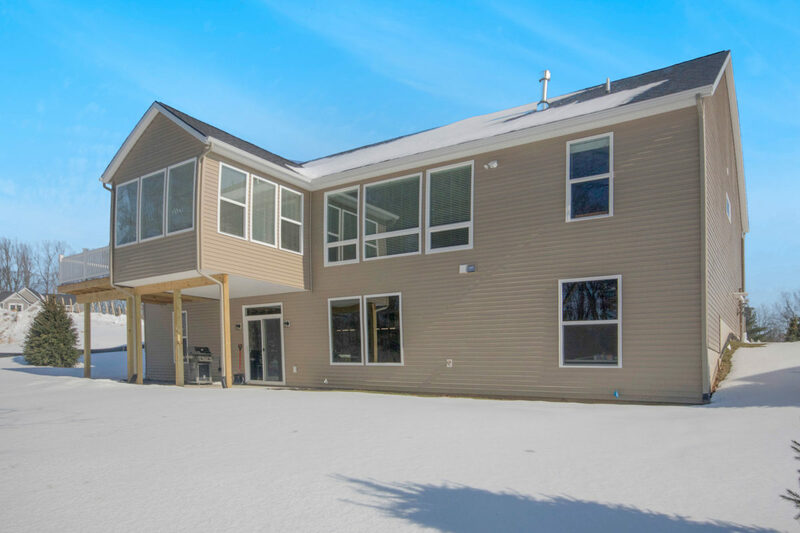 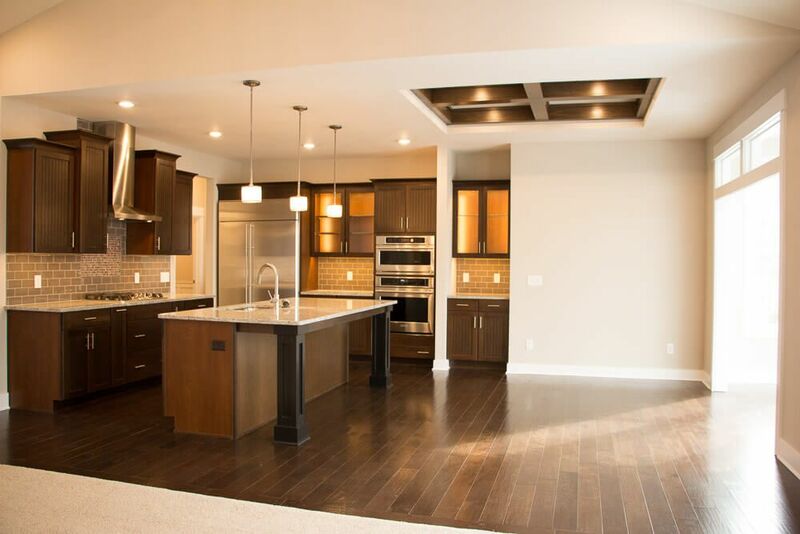 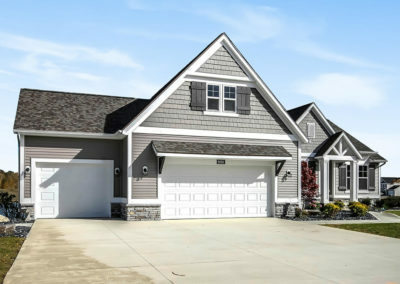 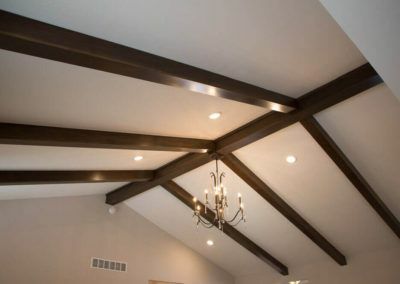 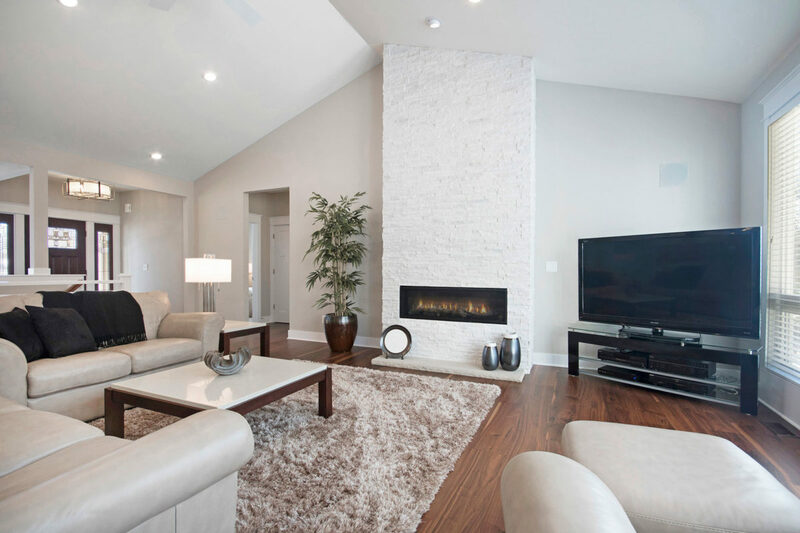 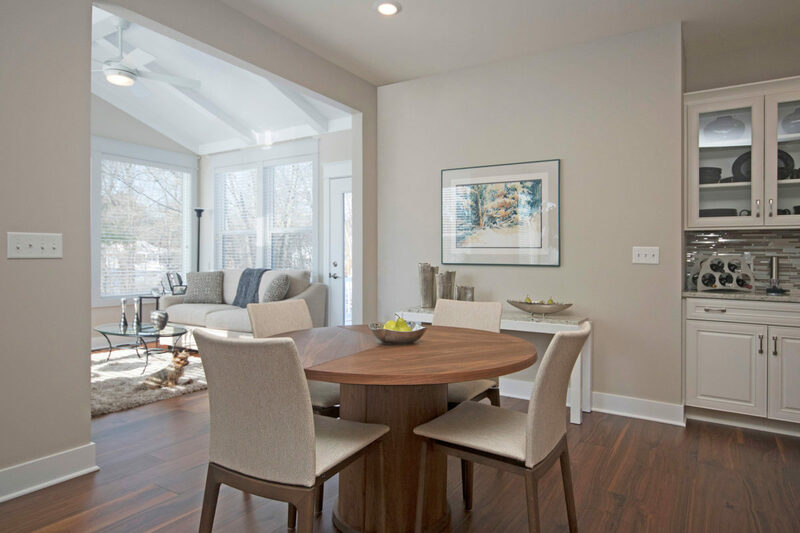 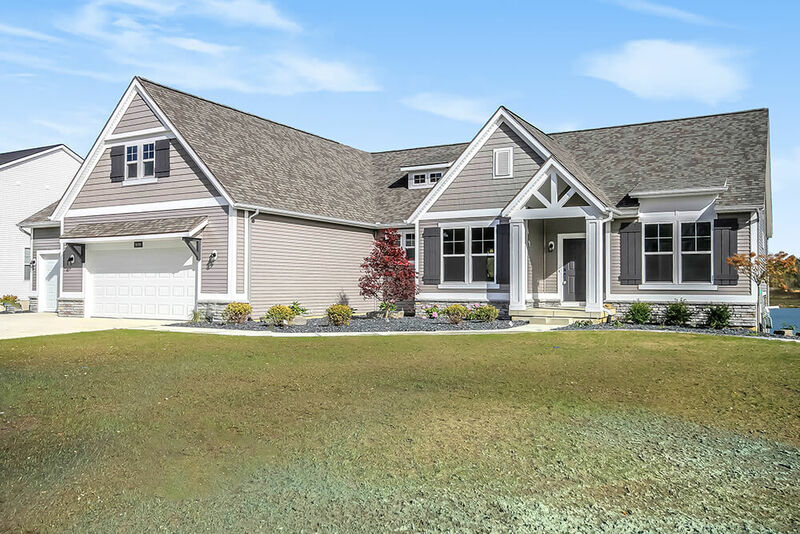 The Fitzgerald home plan is an elegant, contemporary ranch style home. 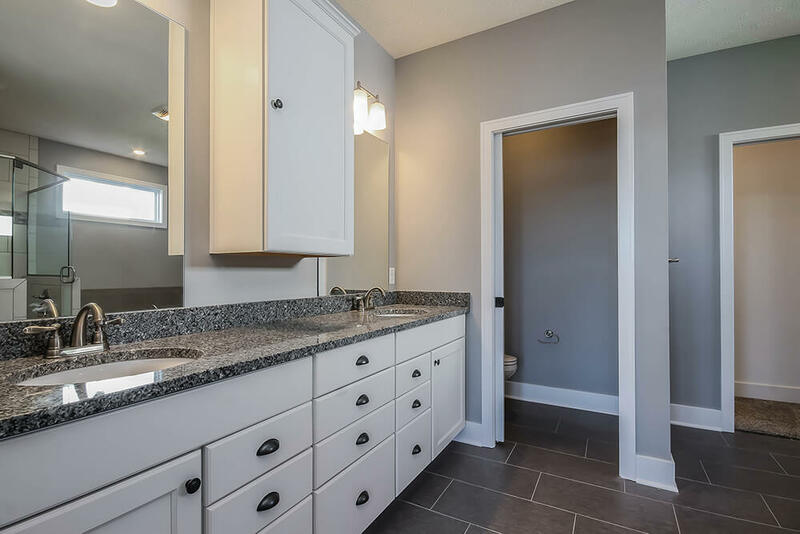 The plan includes three bedrooms, two full baths, one half sized bathroom and 2220 finished square feet, but it doesn’t end there. 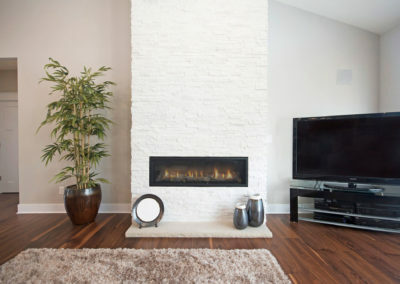 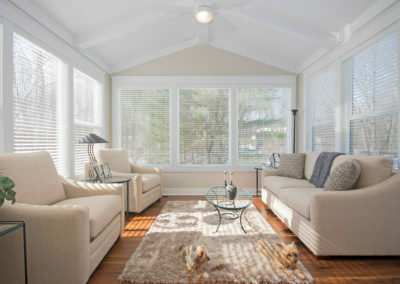 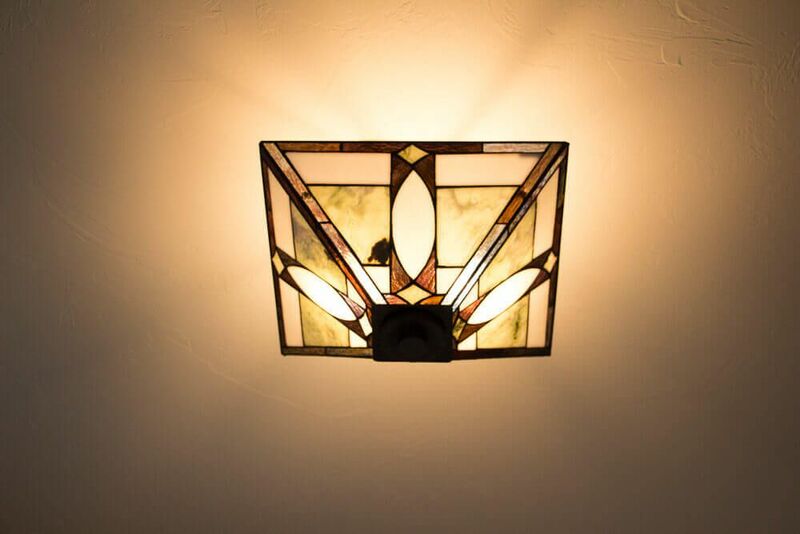 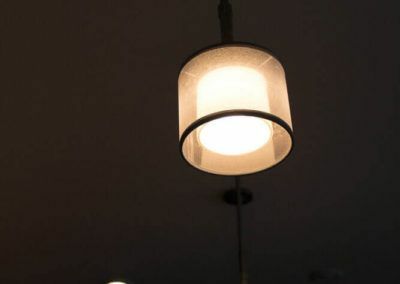 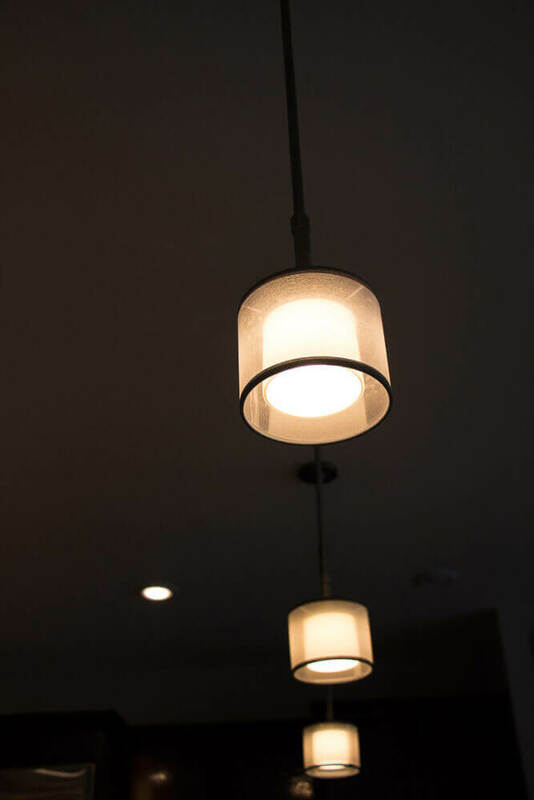 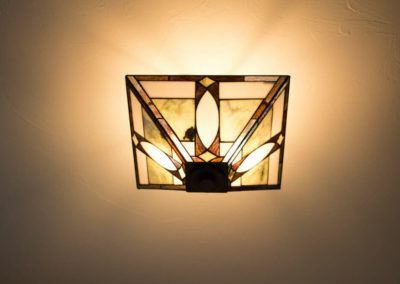 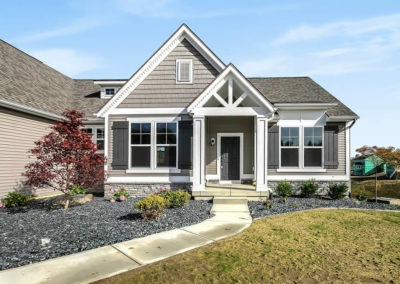 Numerous options allow you to craft a home that suits your needs perfectly with a charm and appeal that it uniquely yours. 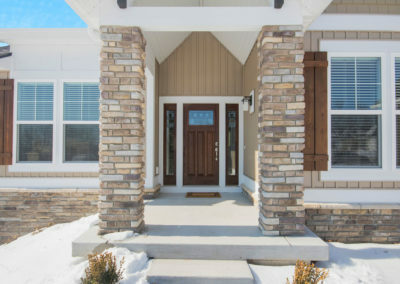 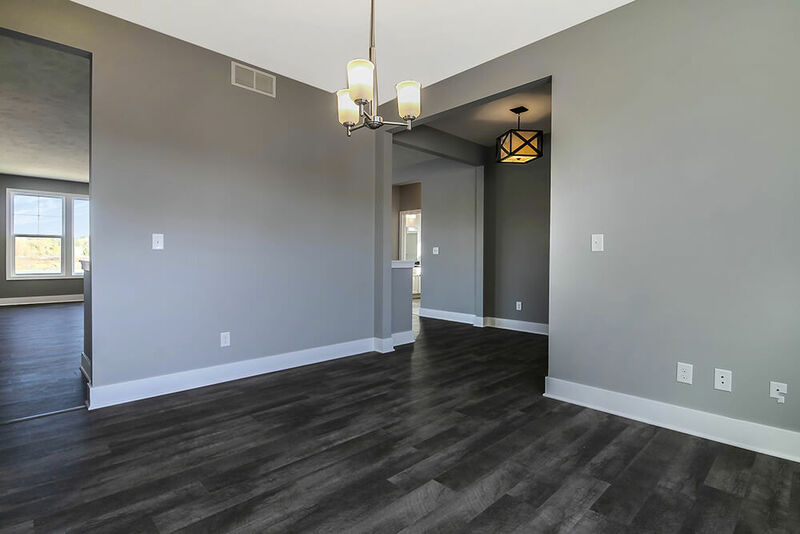 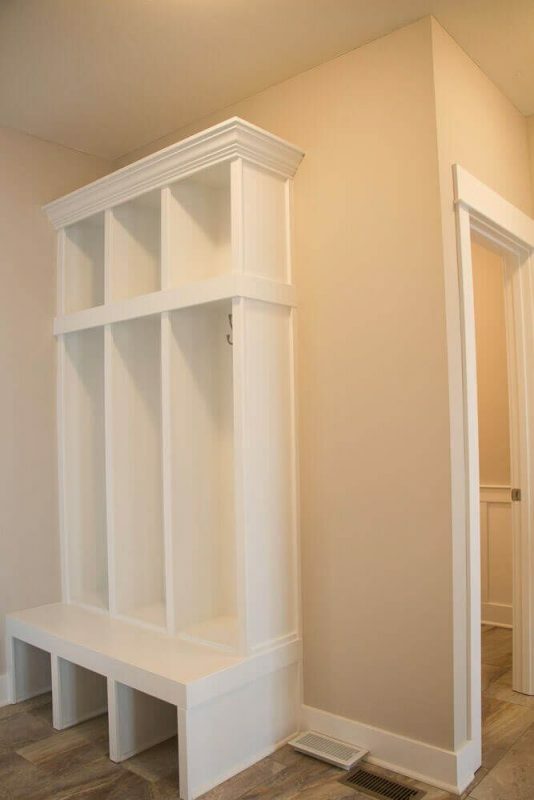 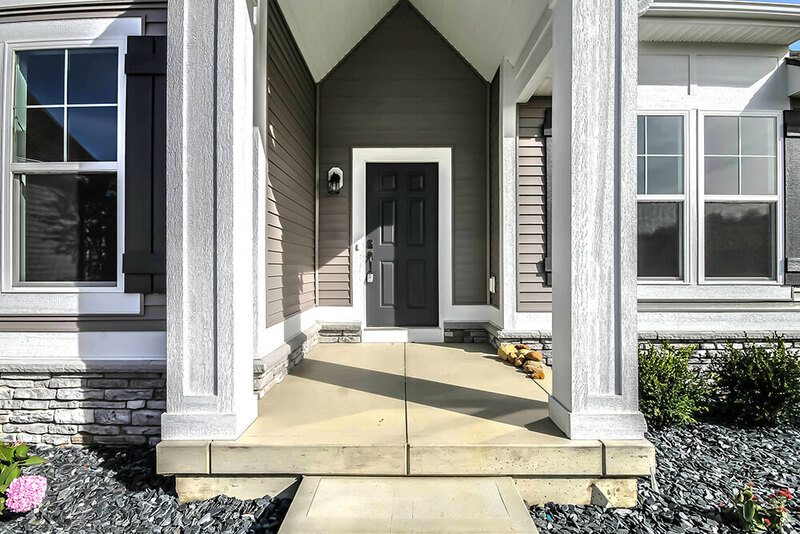 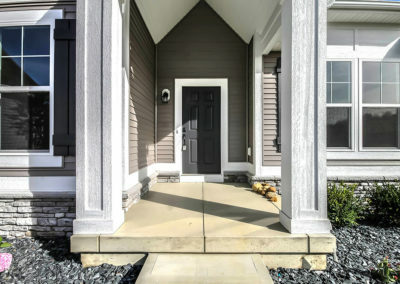 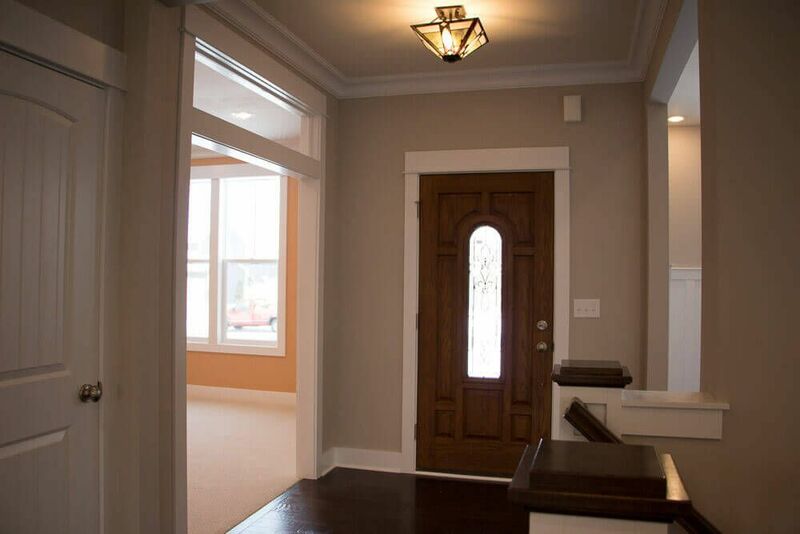 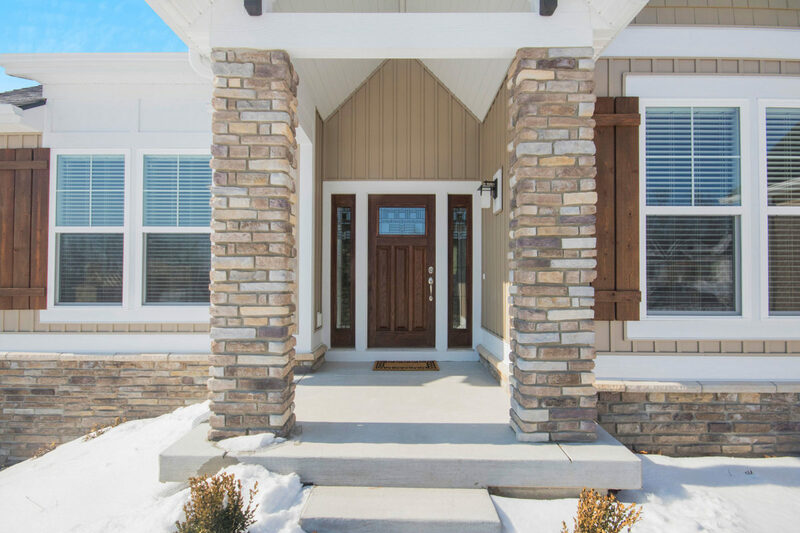 Walk into your new Fitzgerald home from the pillared front porch to the main entry way. 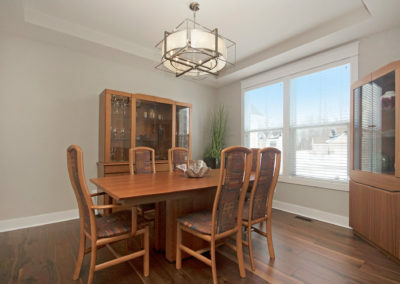 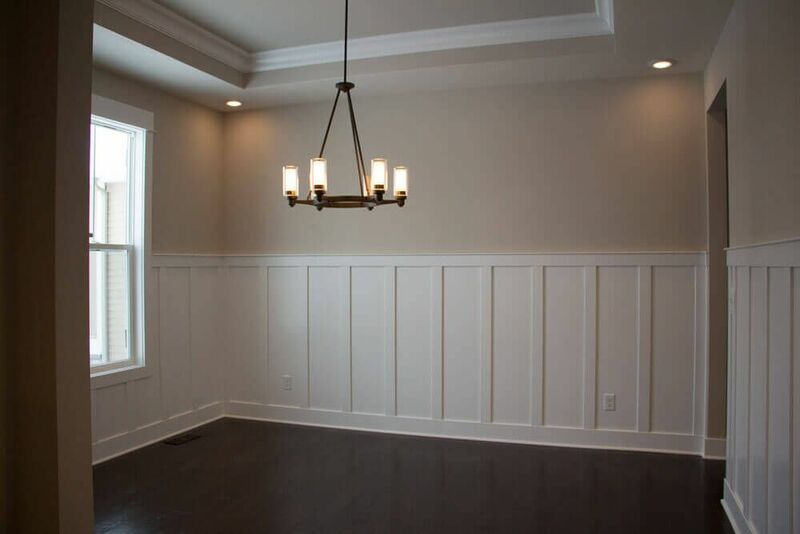 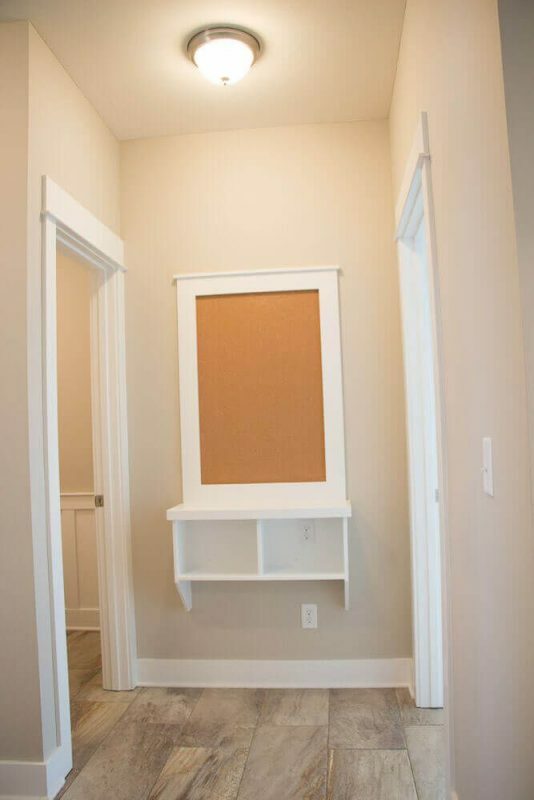 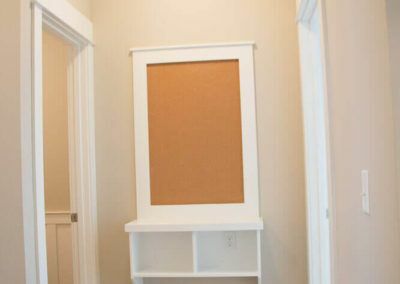 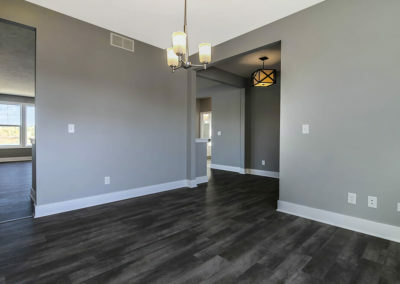 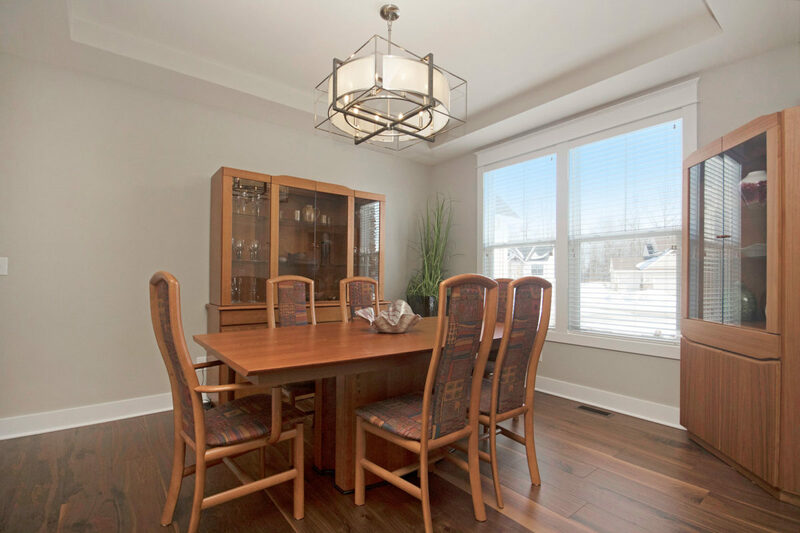 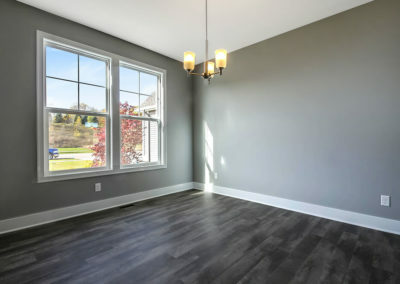 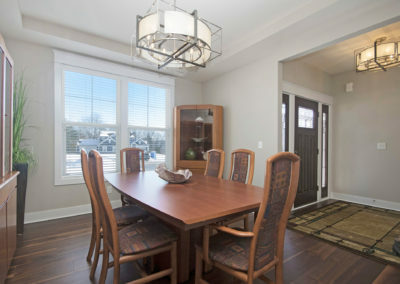 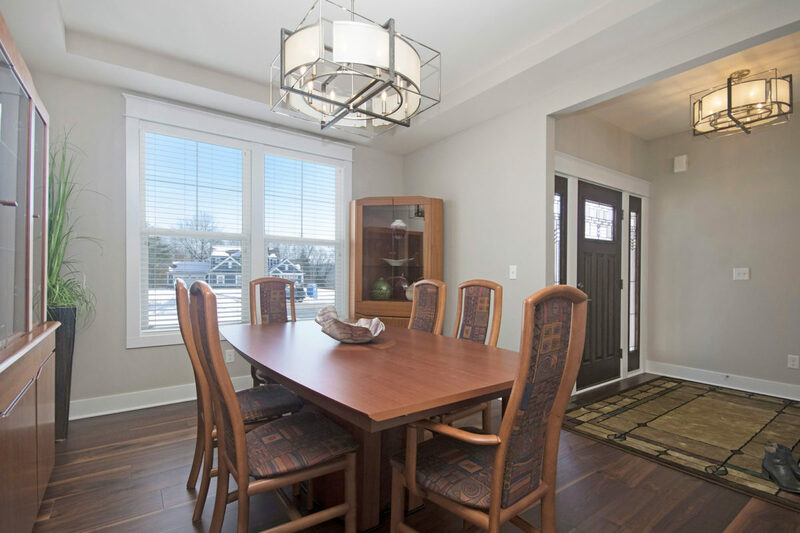 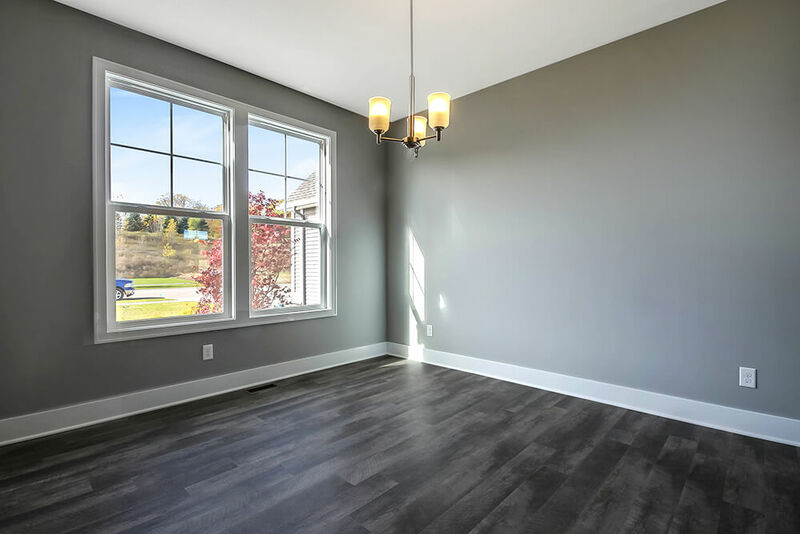 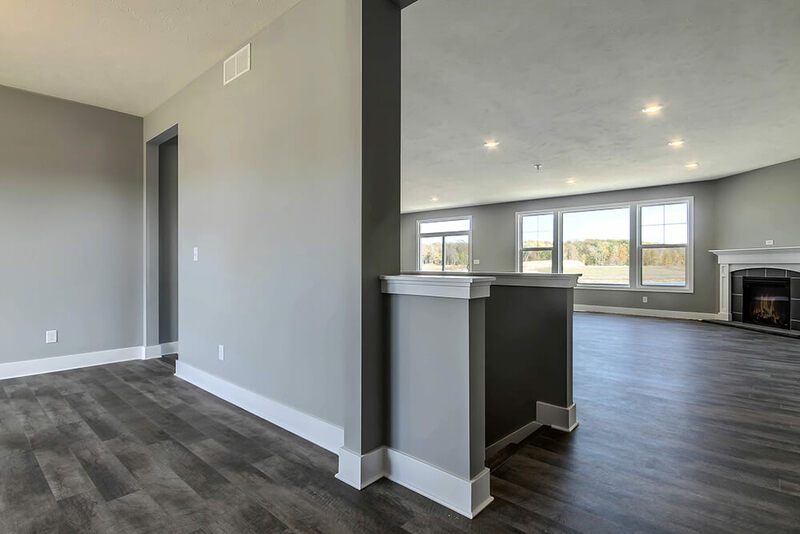 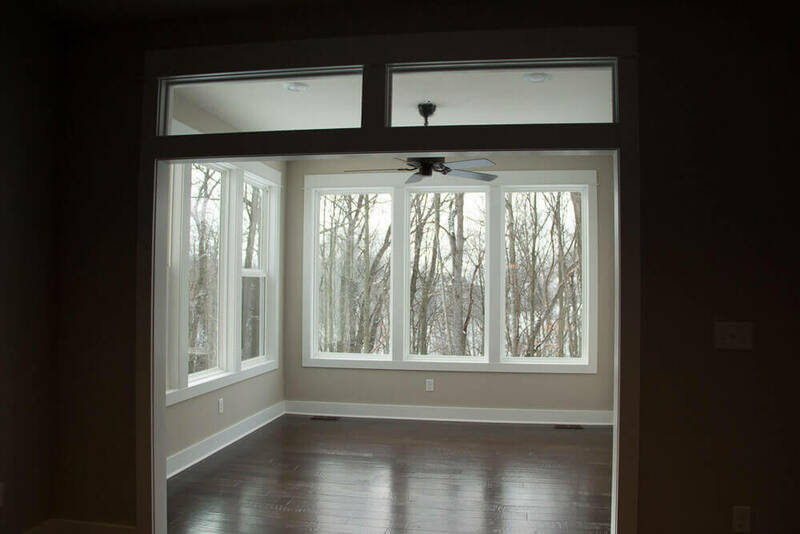 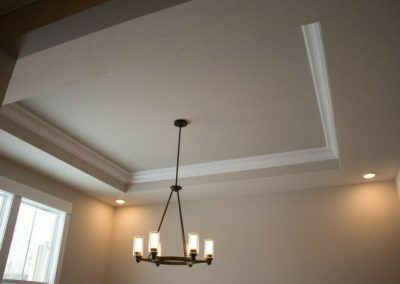 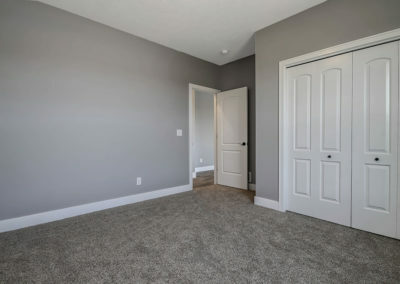 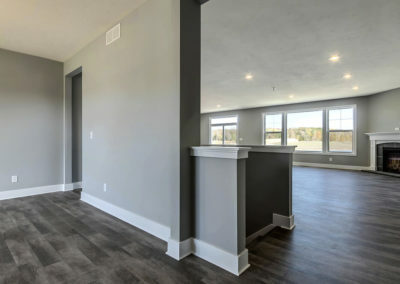 The formal dining area is positioned just off the front hall and can be transformed into an office with stylish French doors, tray ceiling, and closet space to suit your needs. 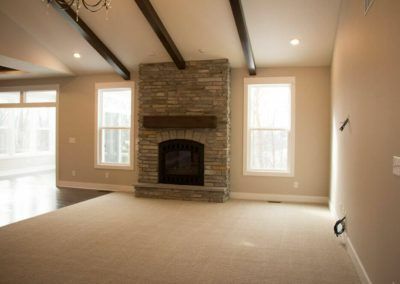 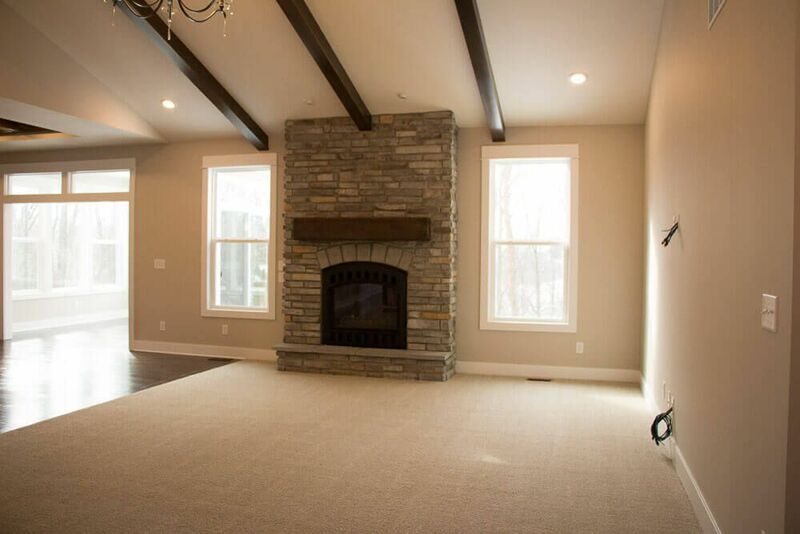 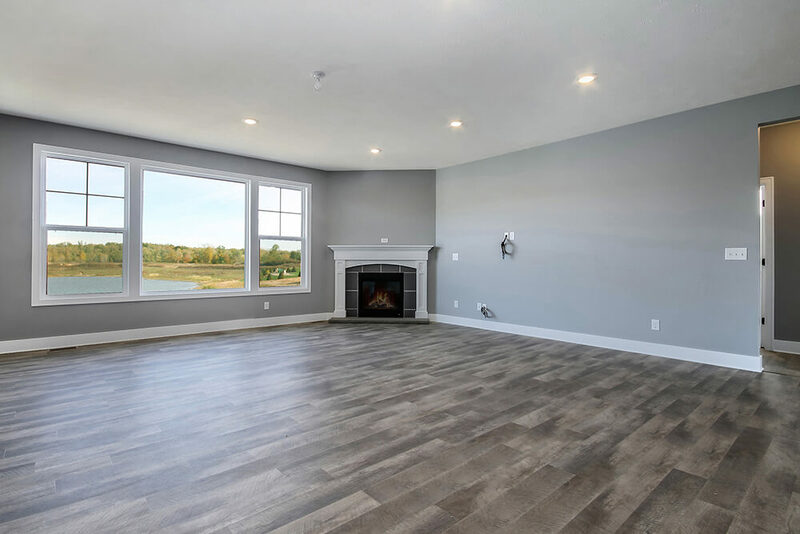 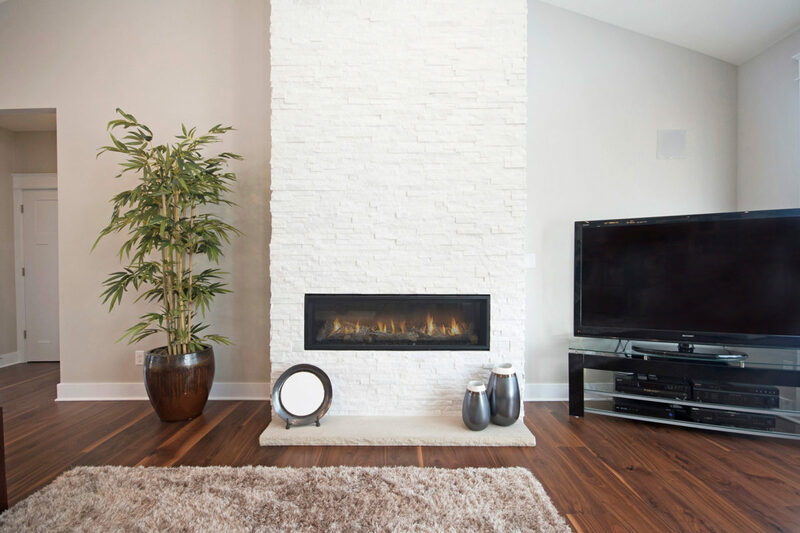 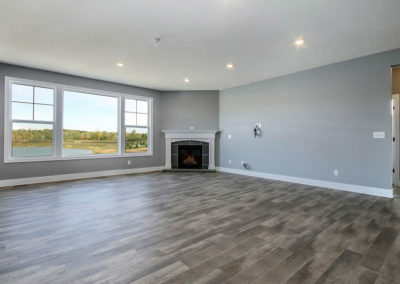 The dining room and entry way lead back into the spacious family room, which can be further enhanced with one of two cozy fireplace options. 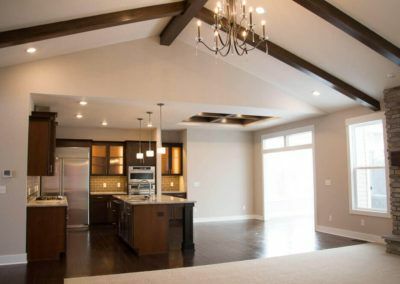 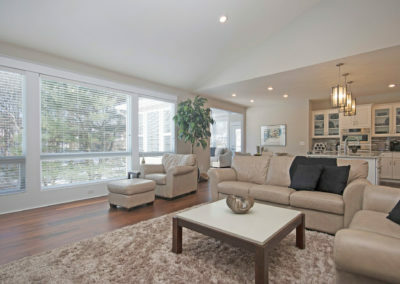 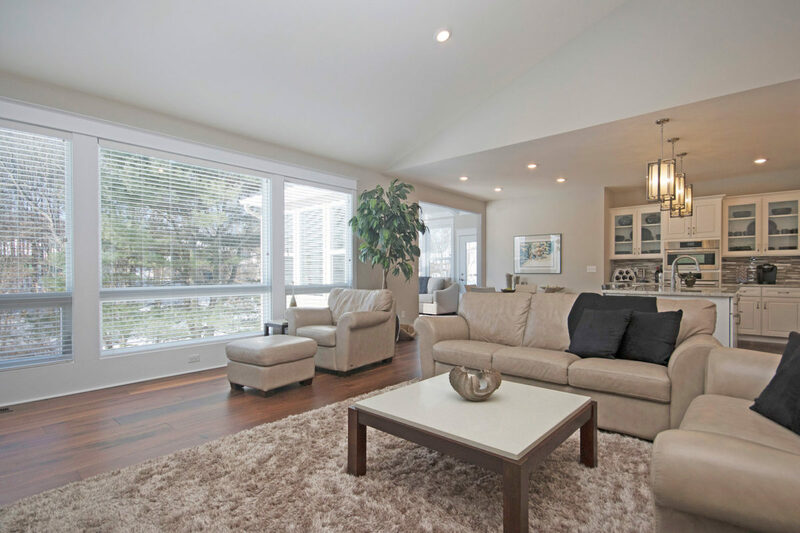 The open family room transitions smoothly into the kitchen and breakfast area. 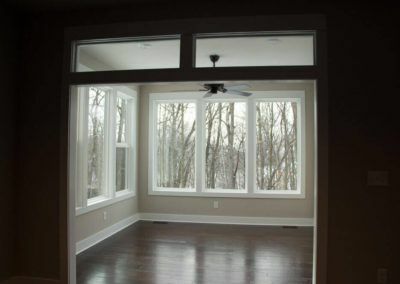 The breakfast area includes a sliding door to the back yard, and can be enlarged with a generous bumpout option. 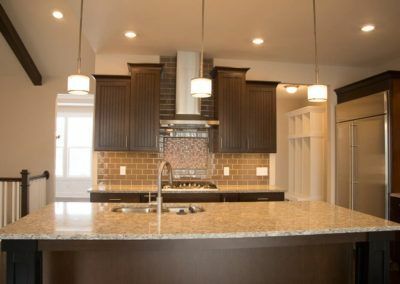 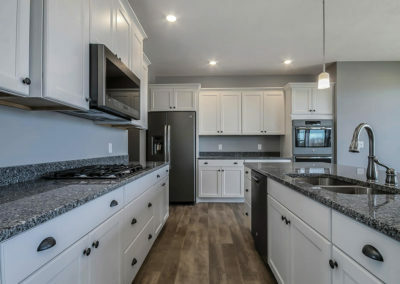 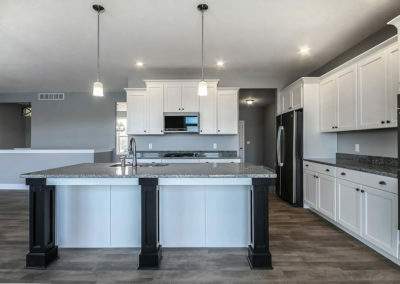 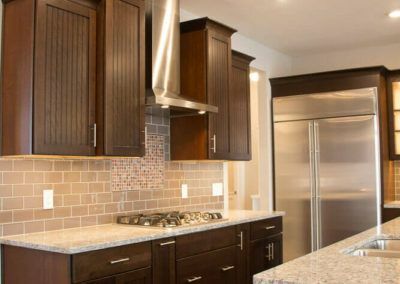 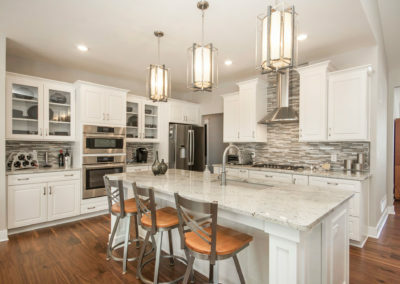 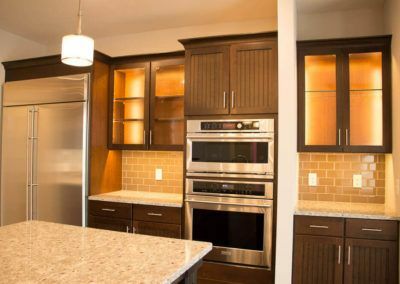 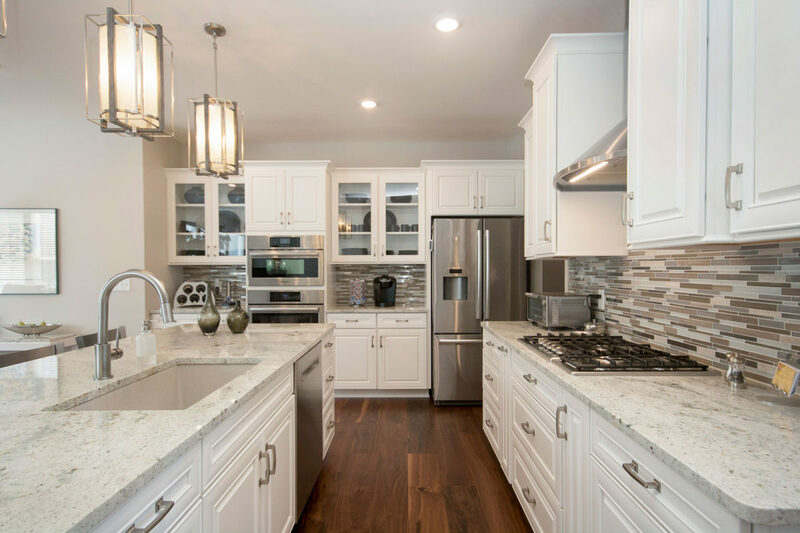 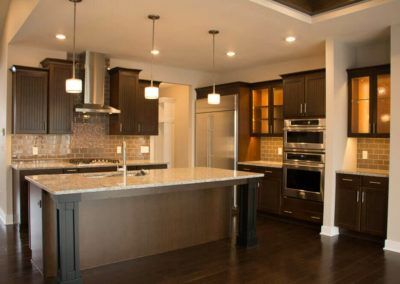 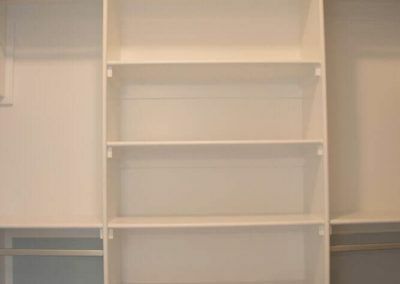 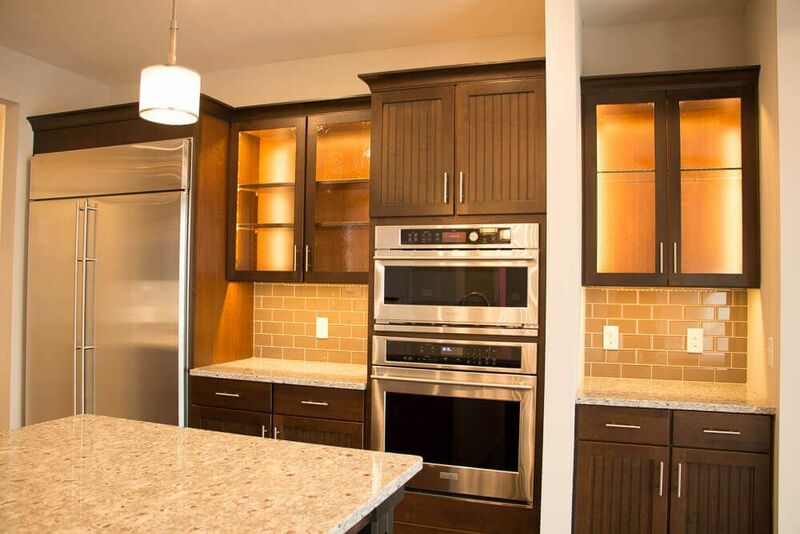 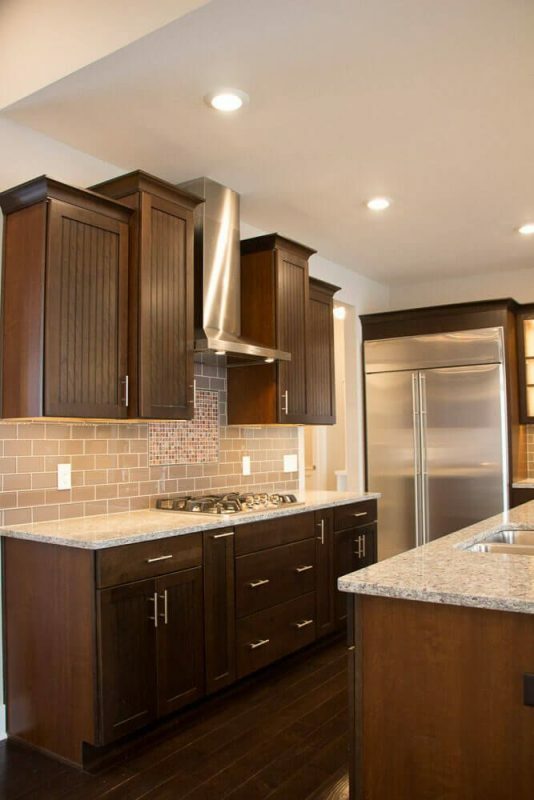 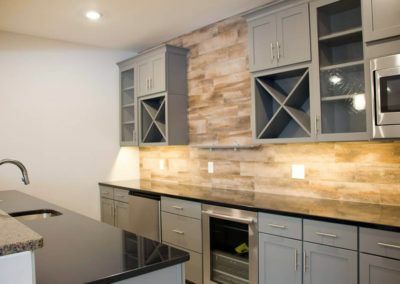 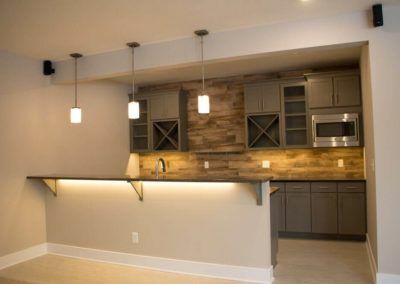 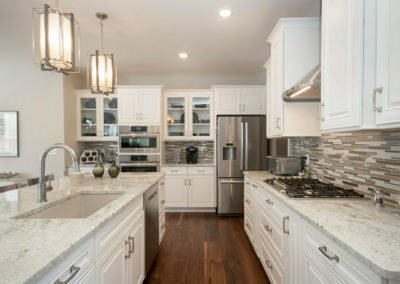 The kitchen includes a sizable walk-in pantry, an island with double sink, and offers multiple options to personalize the cabinets, counters, and appliances to create your own unique space. 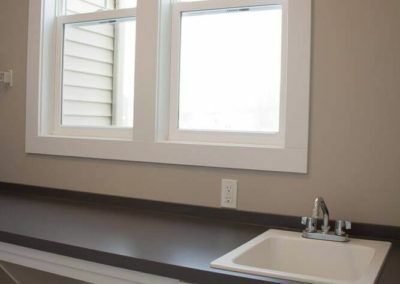 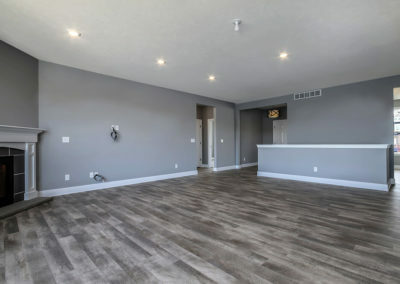 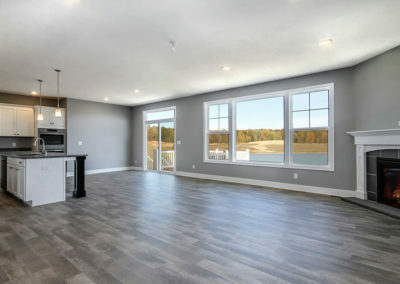 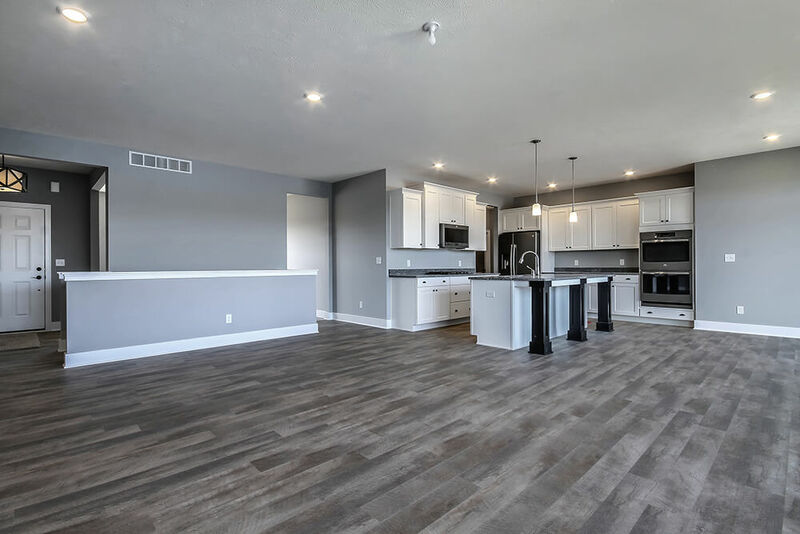 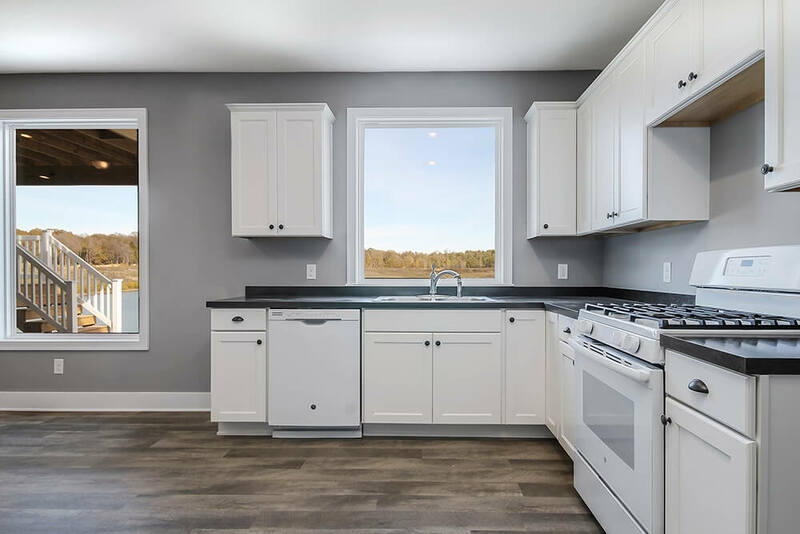 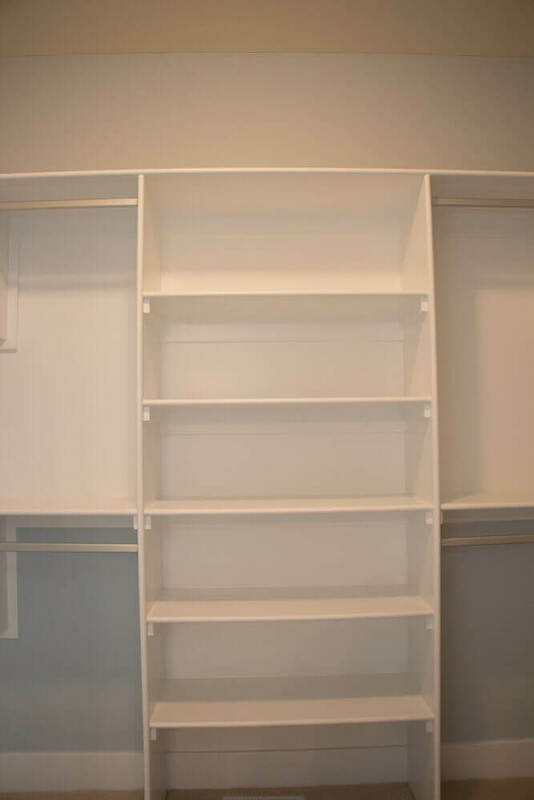 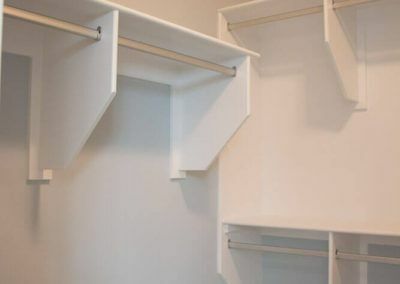 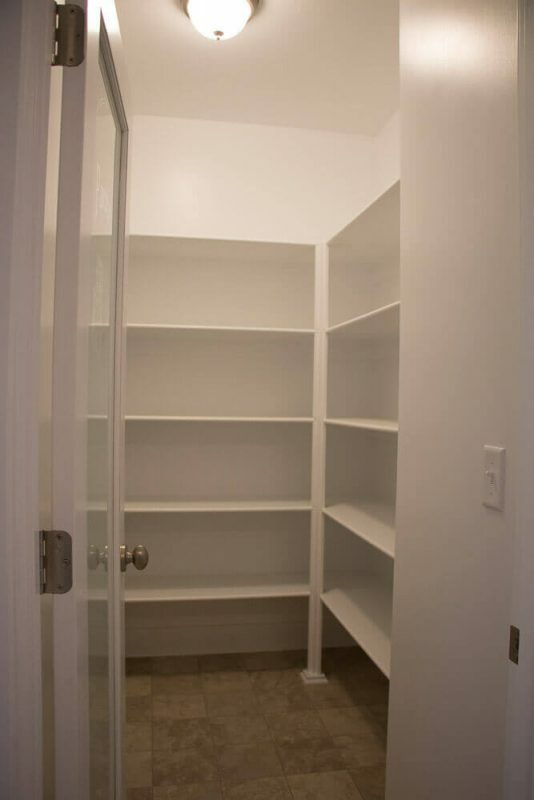 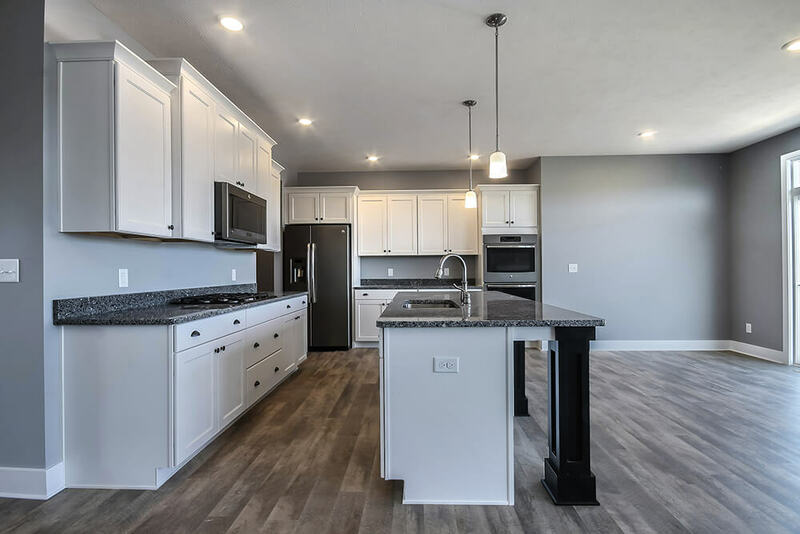 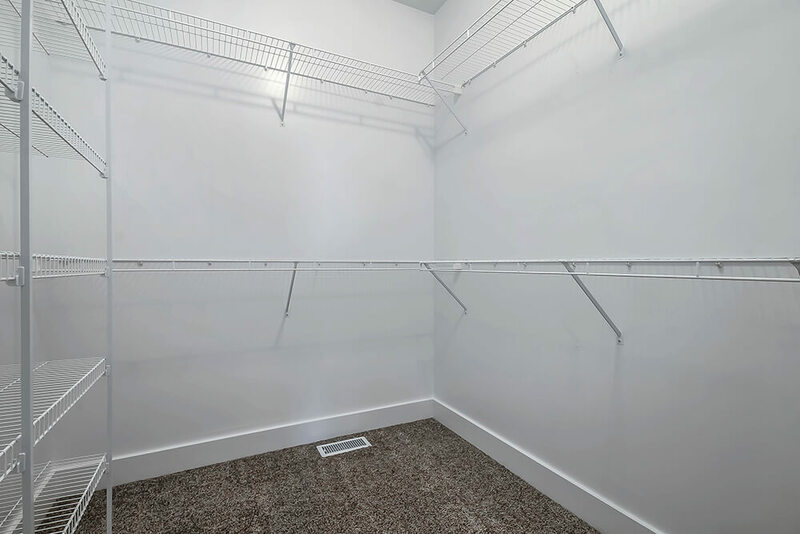 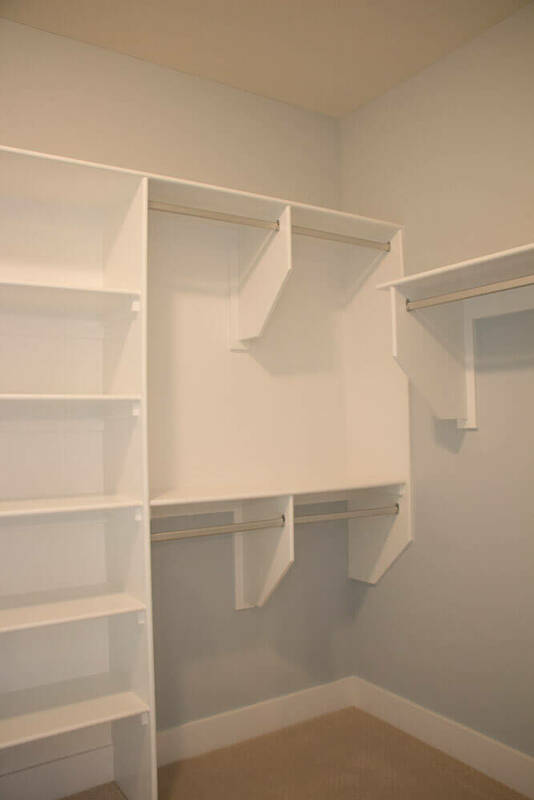 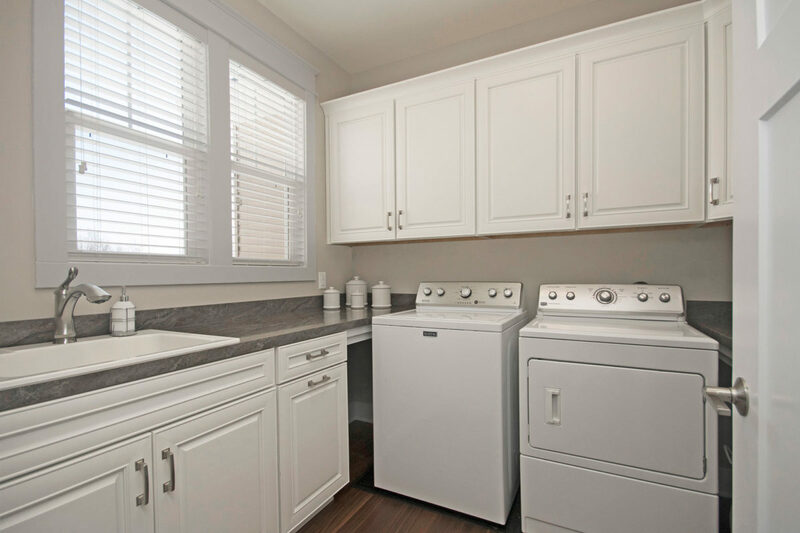 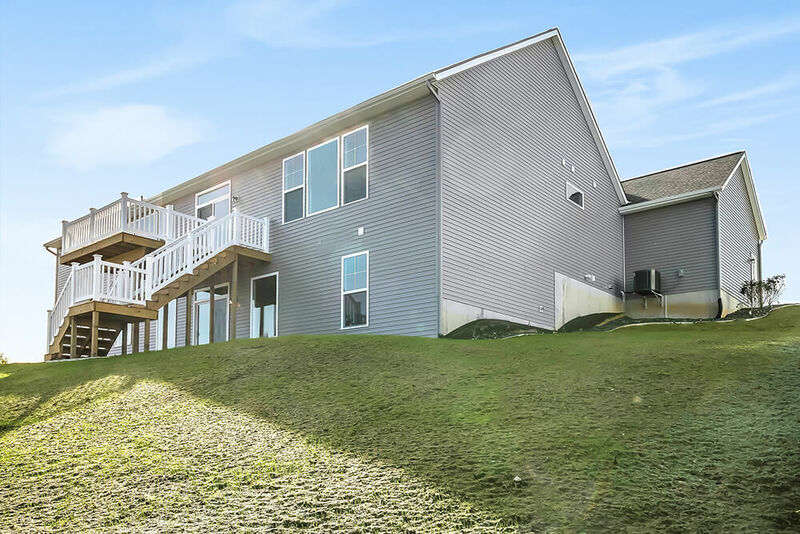 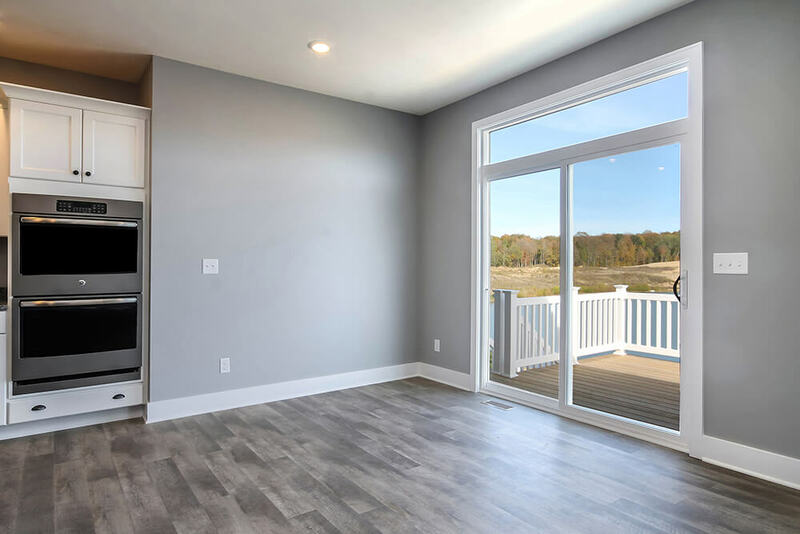 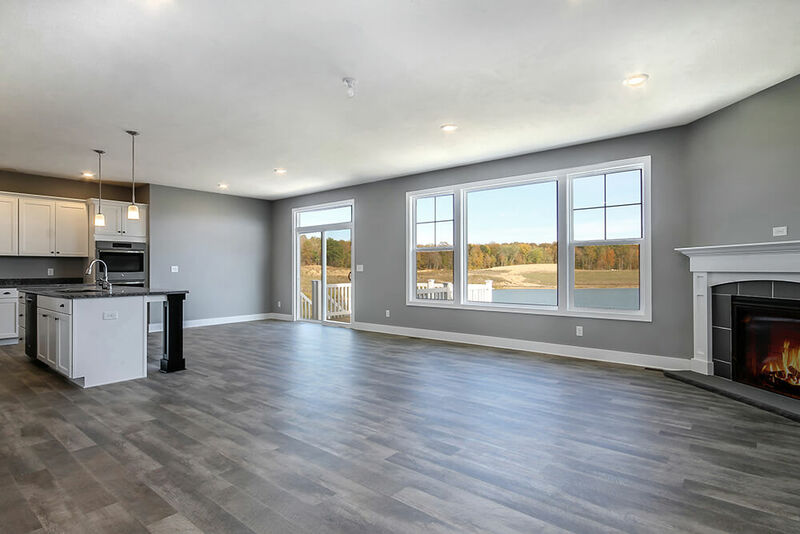 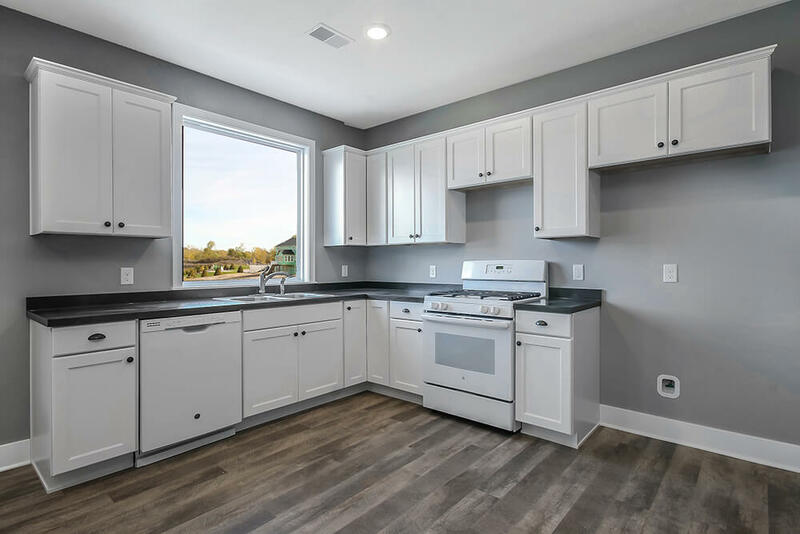 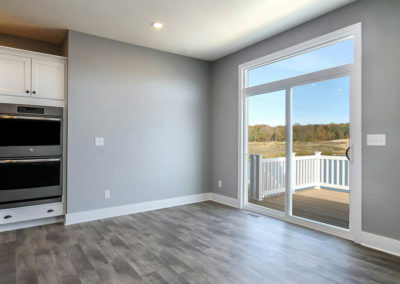 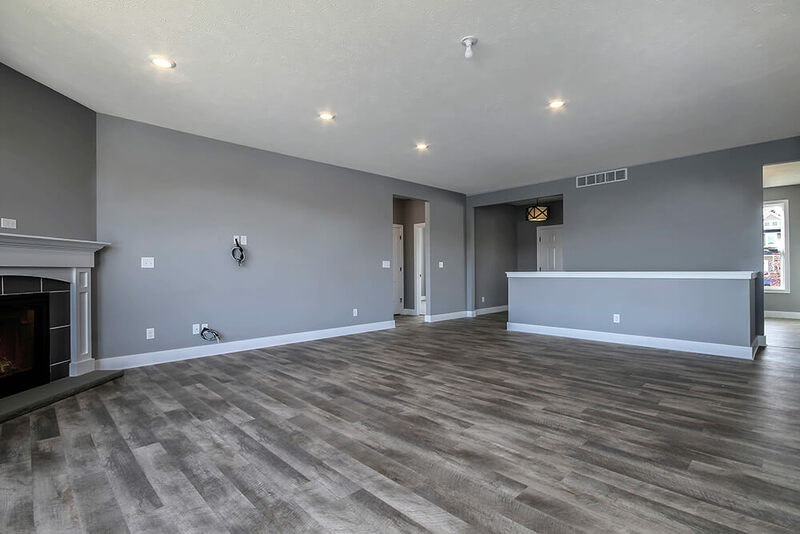 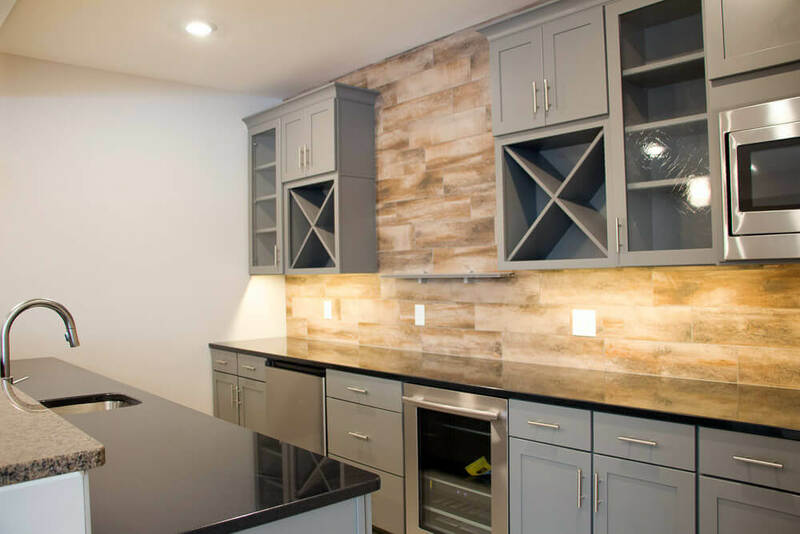 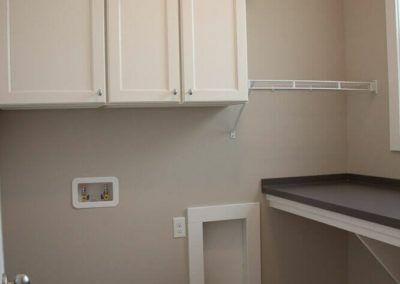 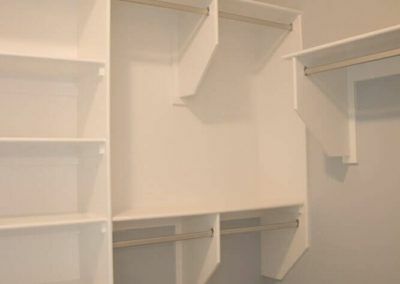 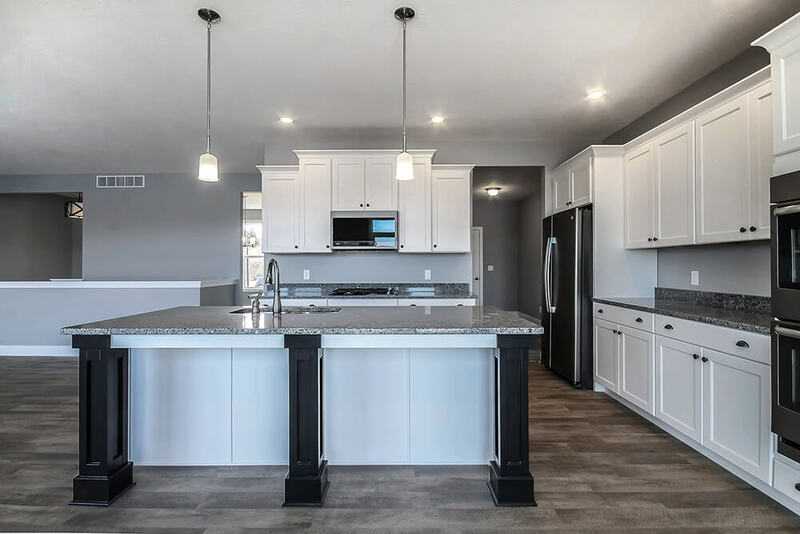 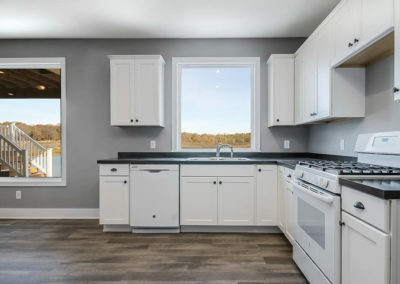 The kitchen leads back to the mudroom with optional lockers and drop zone, the main level laundry room with optional folding counter or cabinets, an optional half bath, and the substantial two or three car garage. 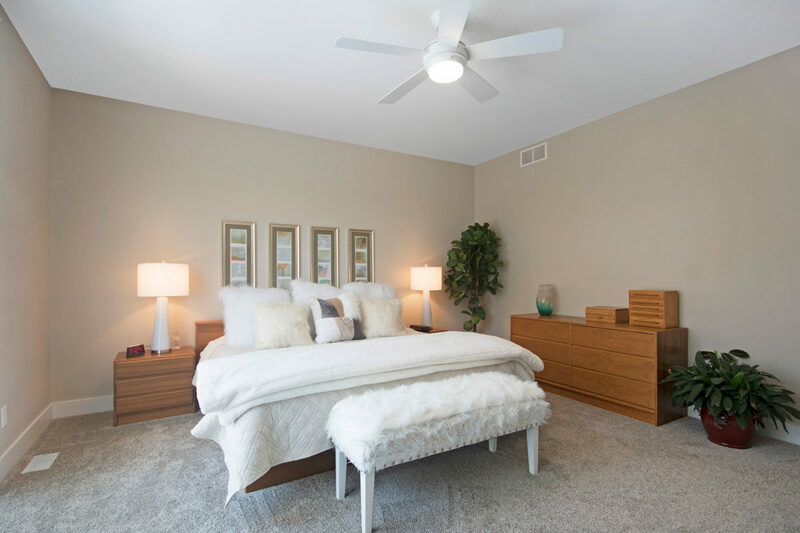 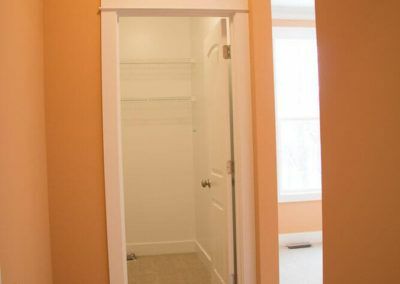 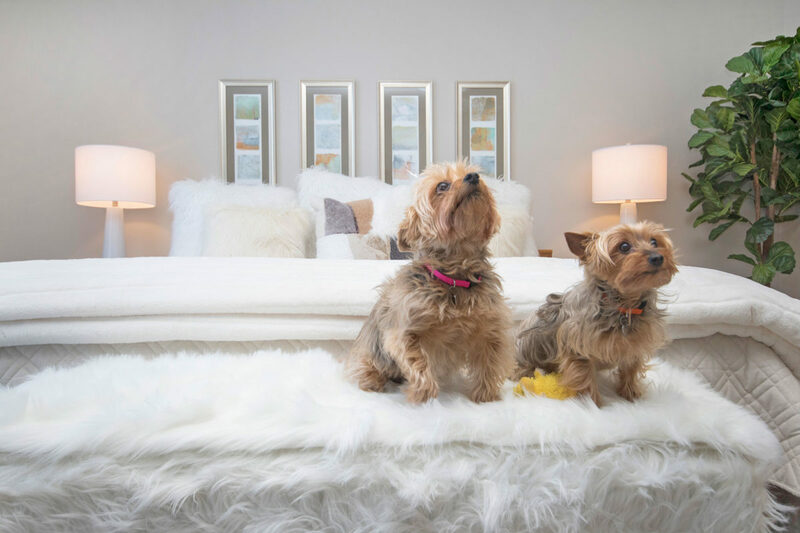 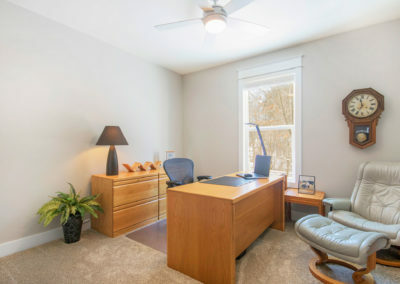 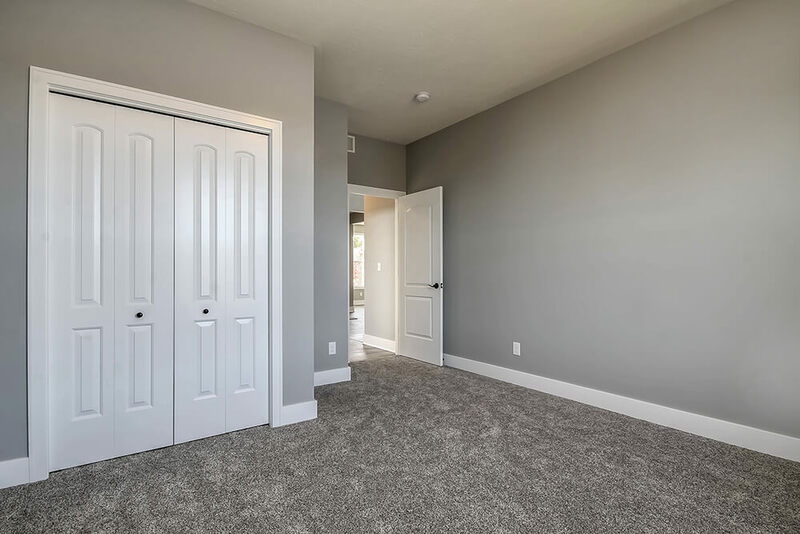 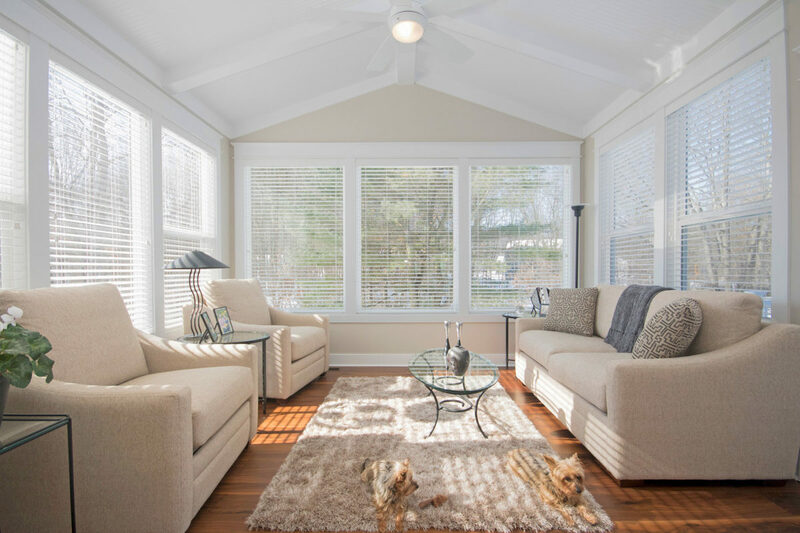 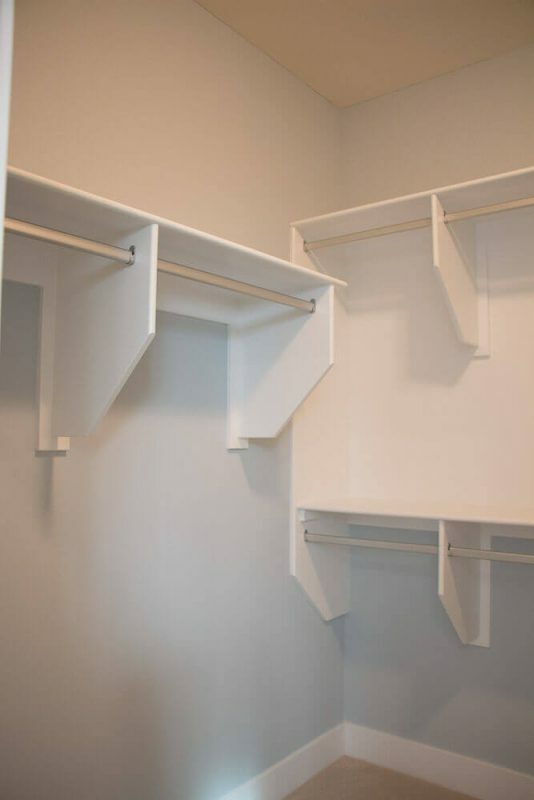 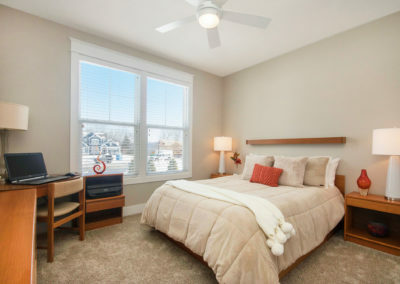 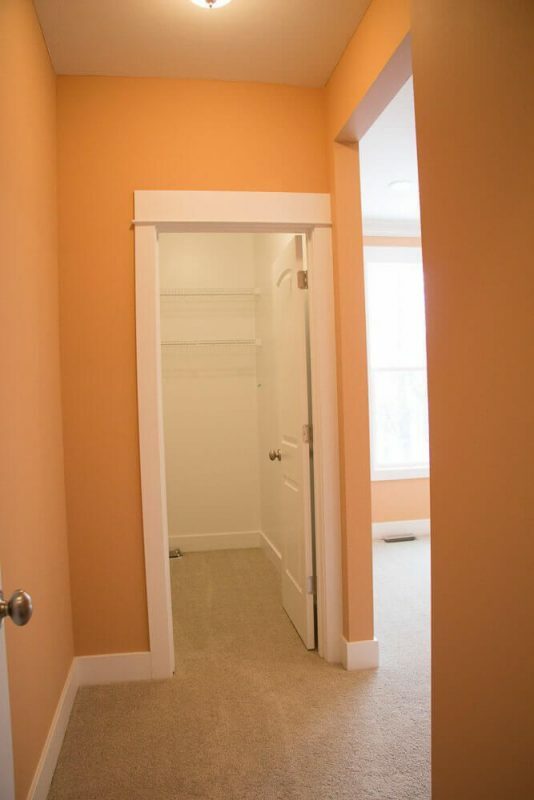 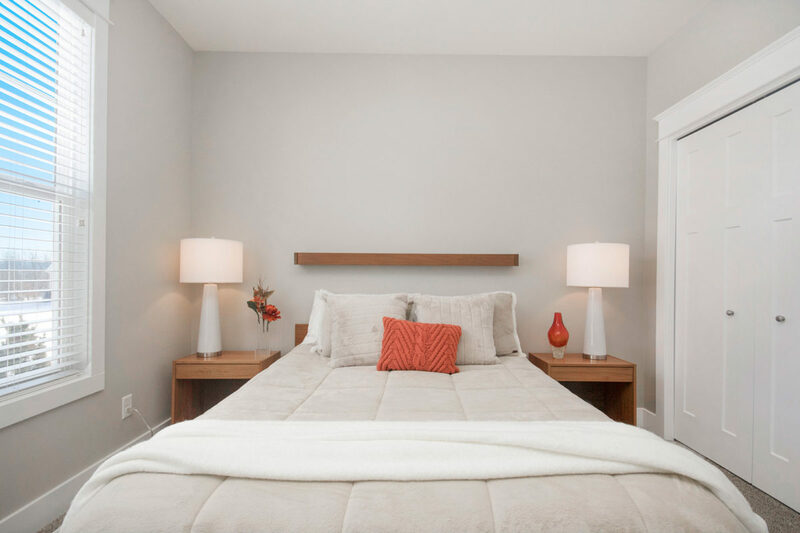 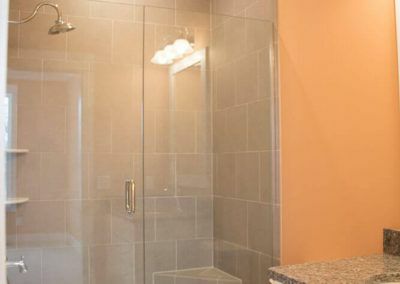 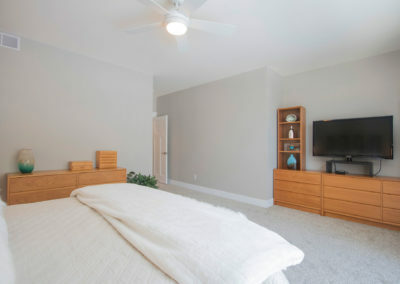 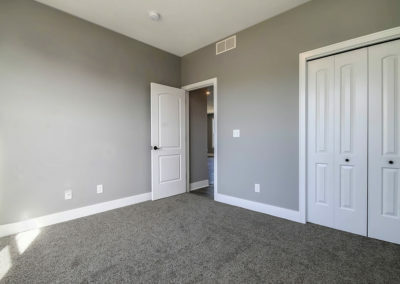 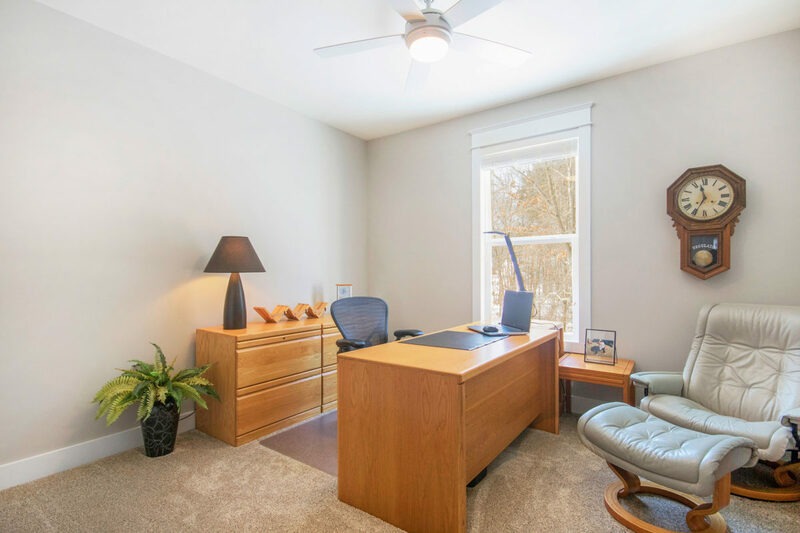 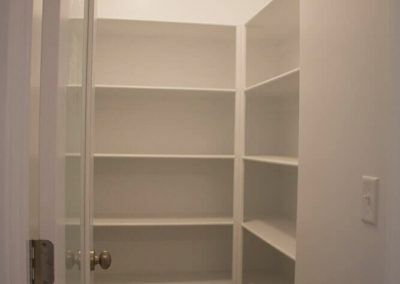 The owner's suite is located off of the kitchen and incorporates a sunlit master bedroom, a private master bathroom, and a large walk-in closet. 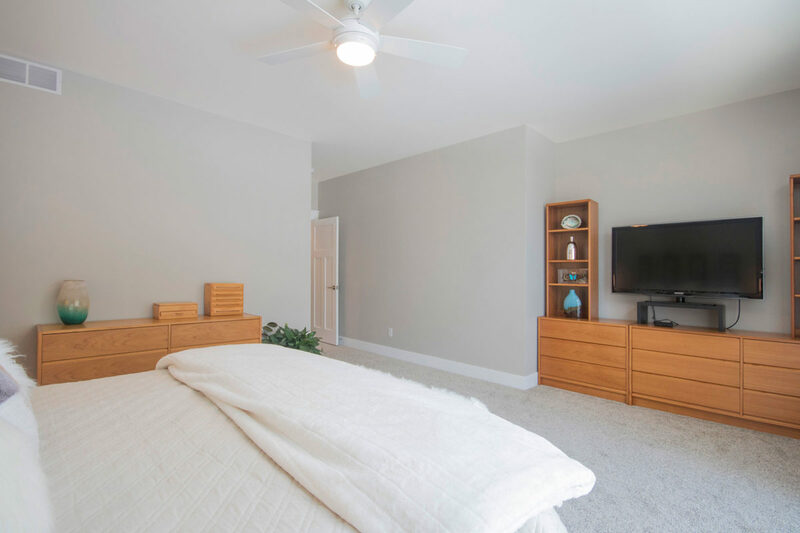 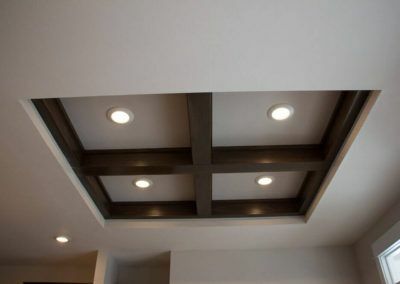 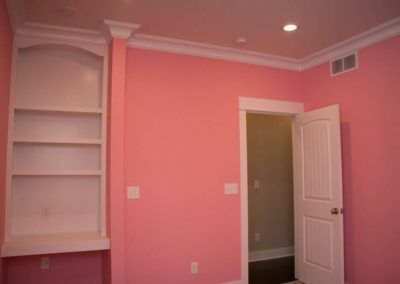 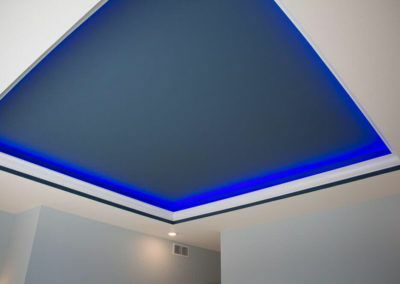 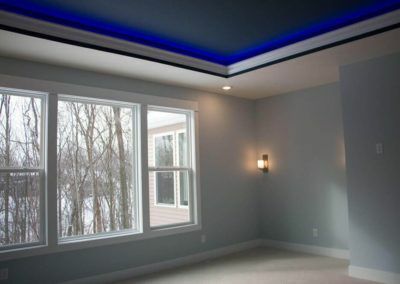 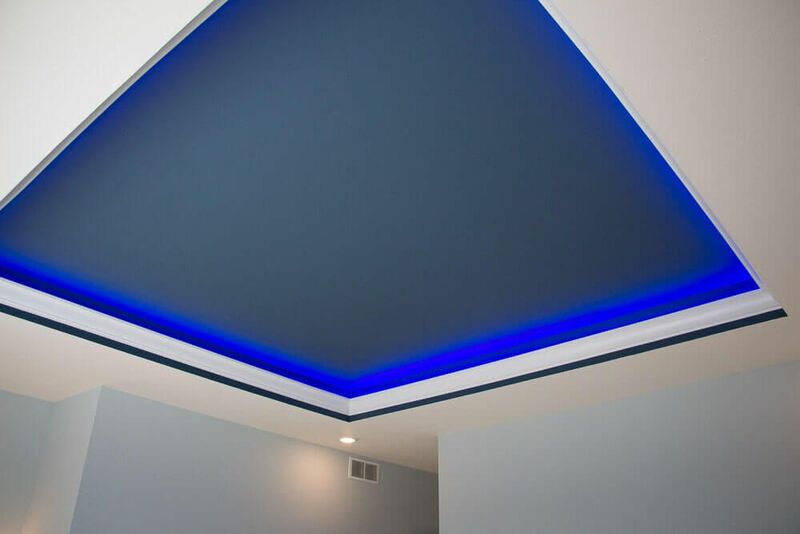 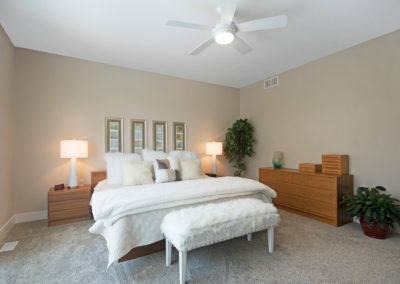 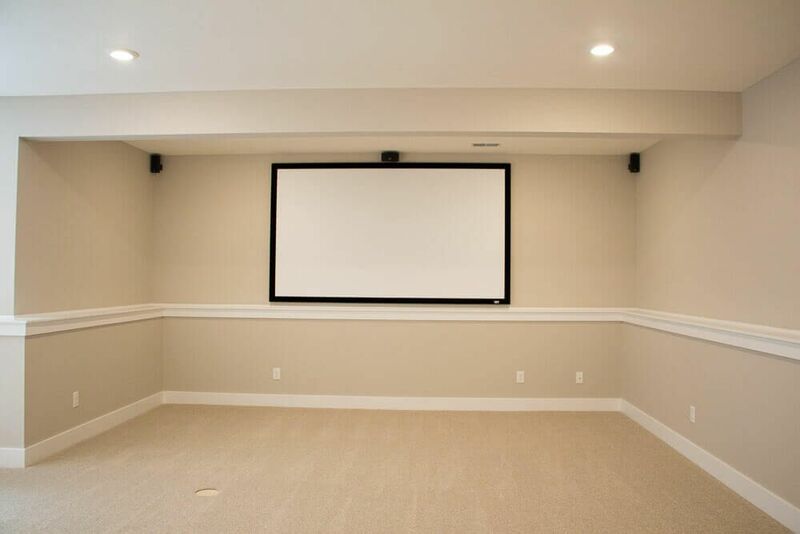 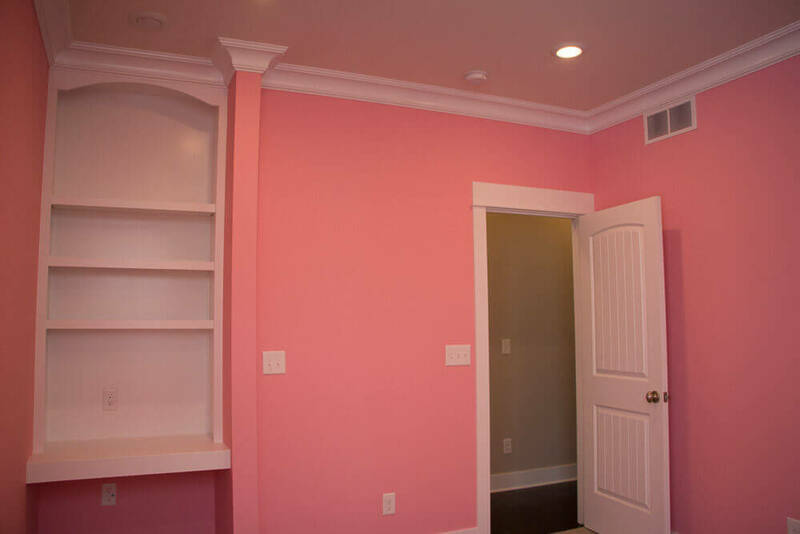 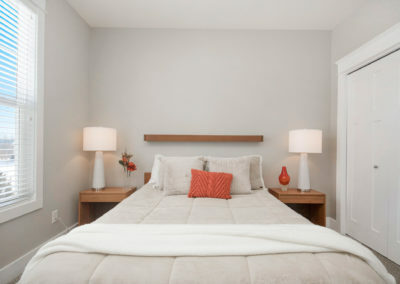 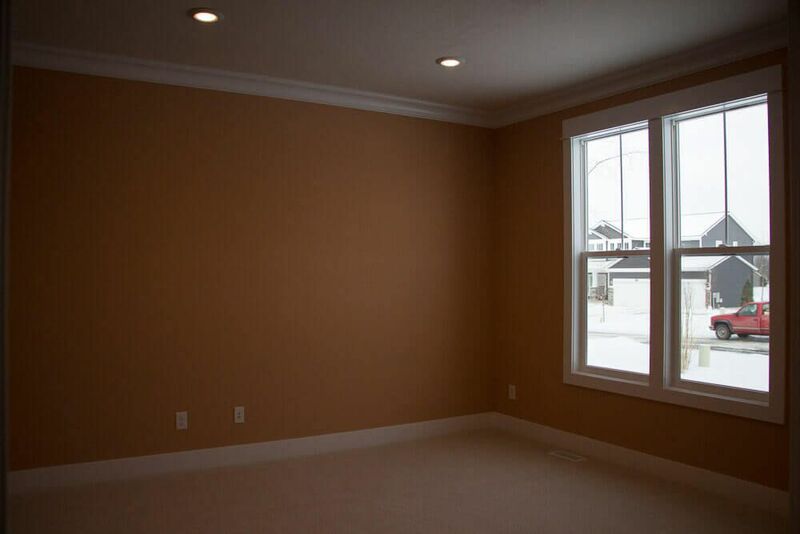 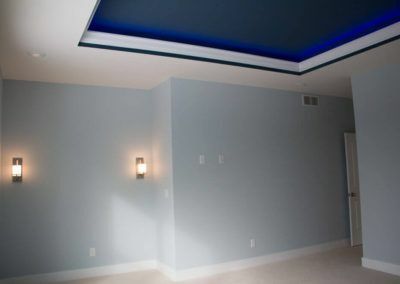 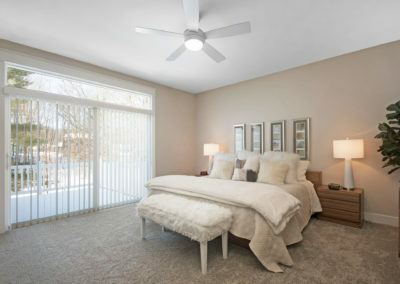 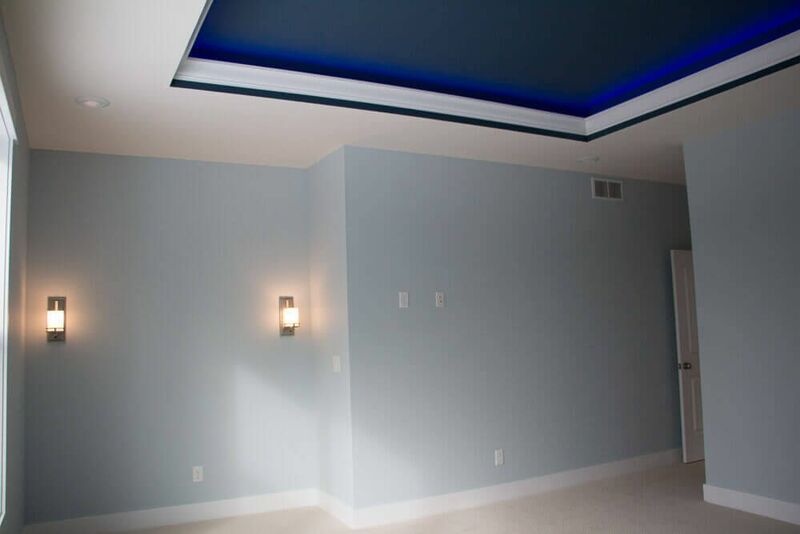 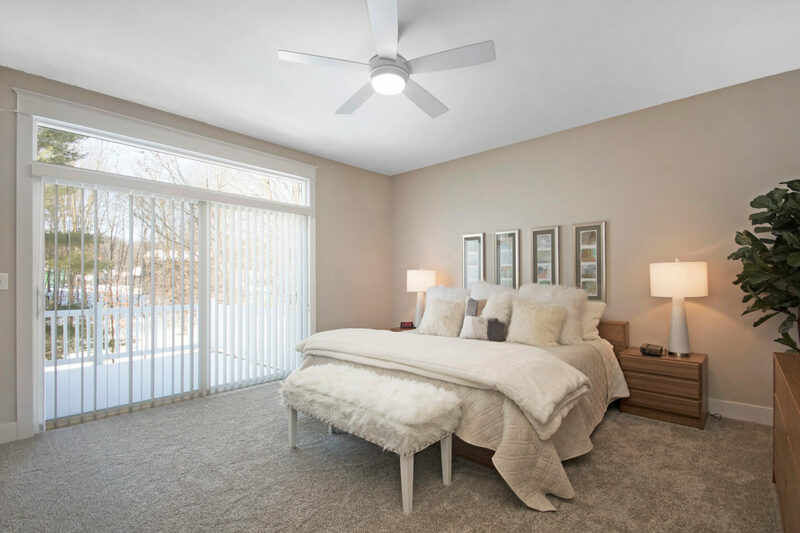 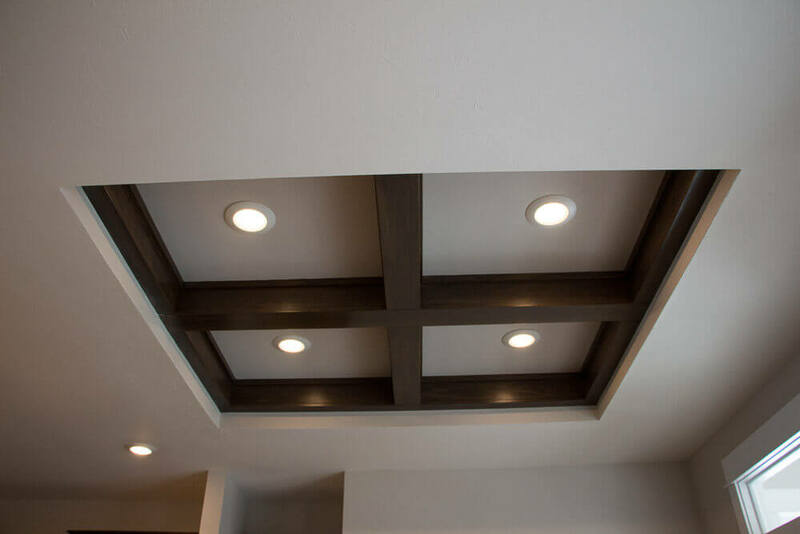 The master bedroom can be expanded for additional space and offers an optional tray ceiling. 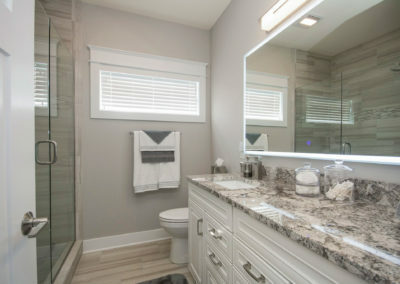 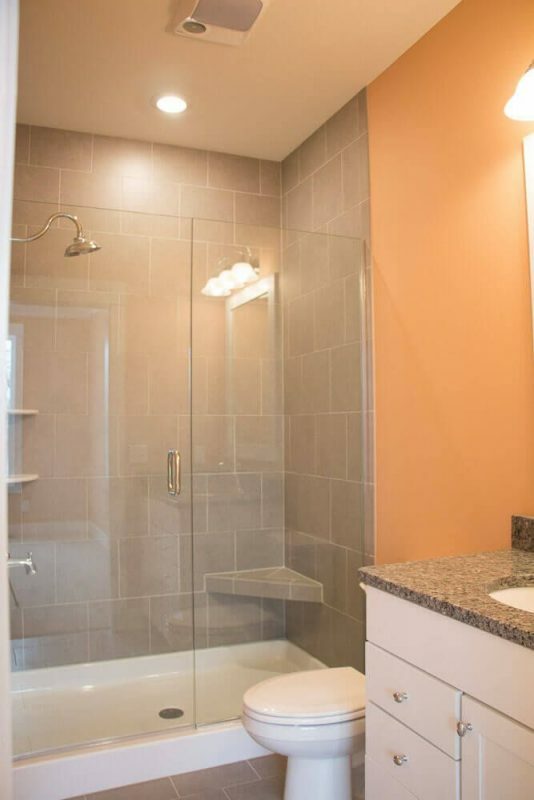 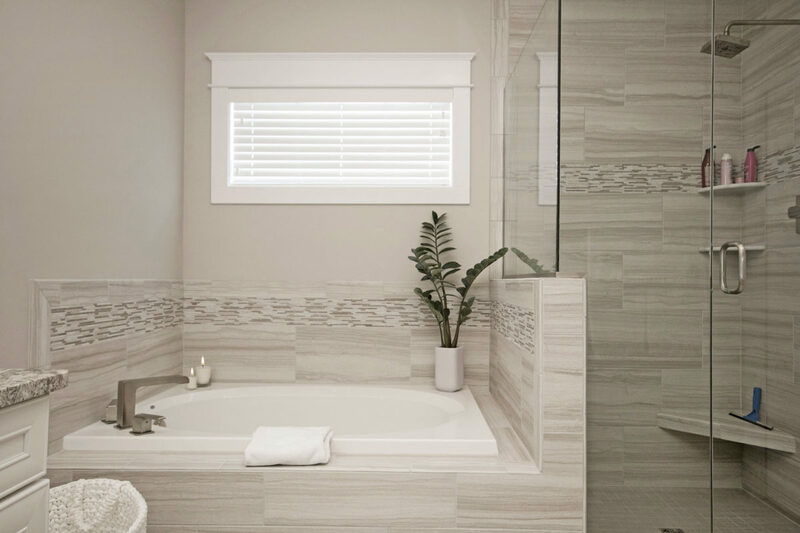 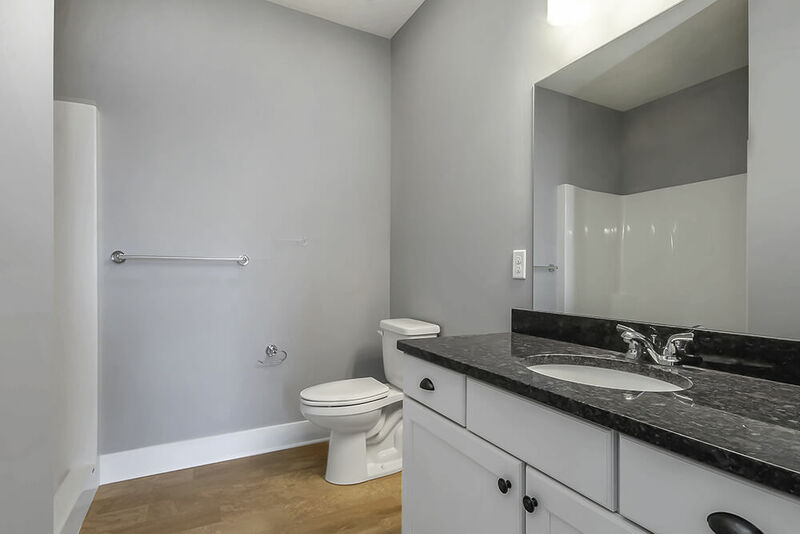 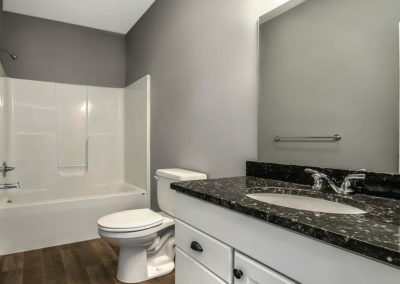 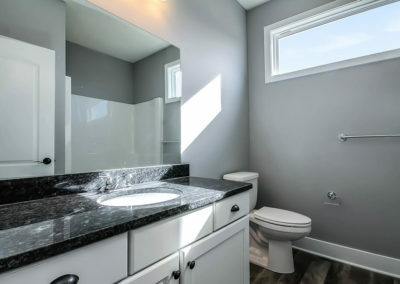 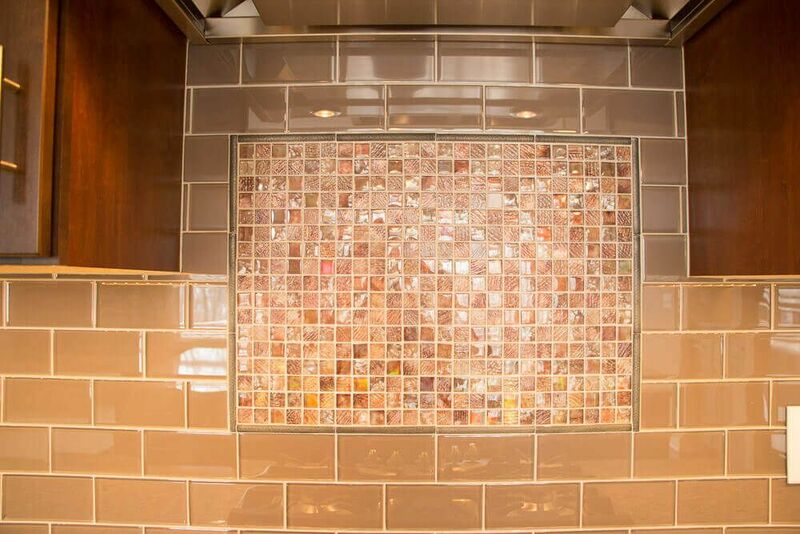 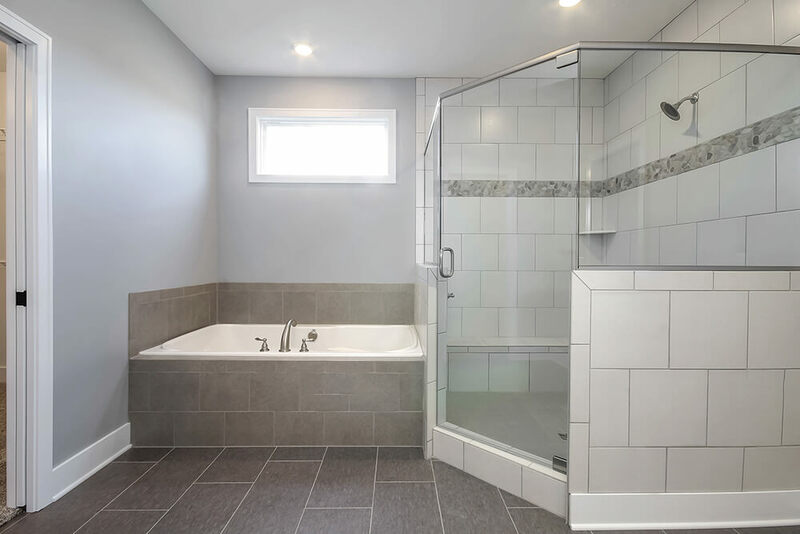 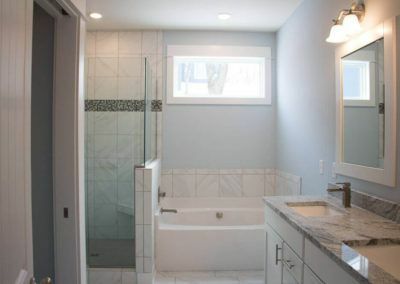 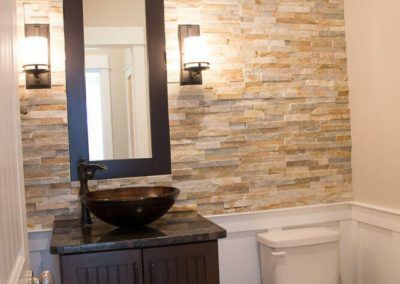 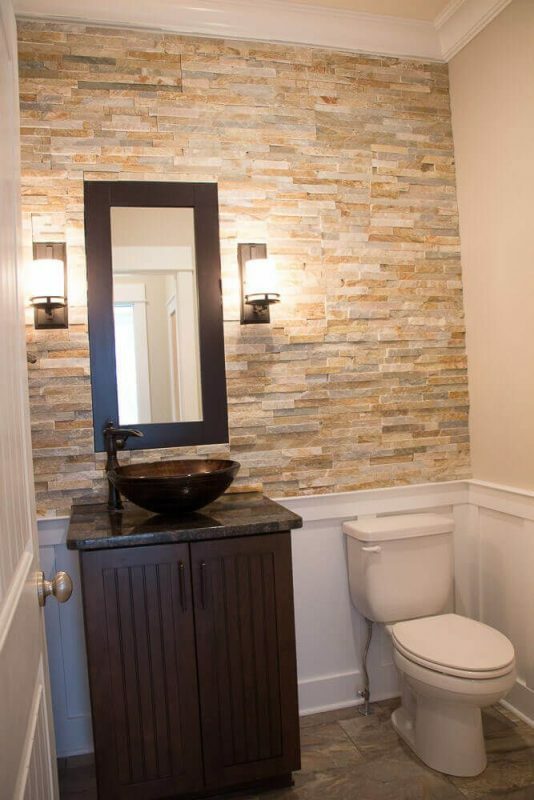 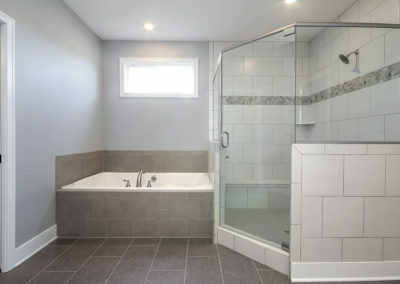 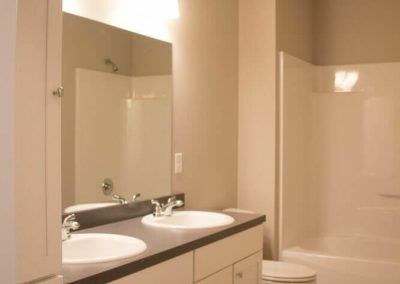 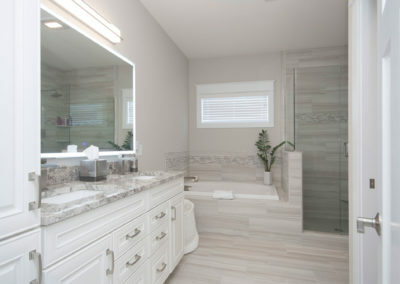 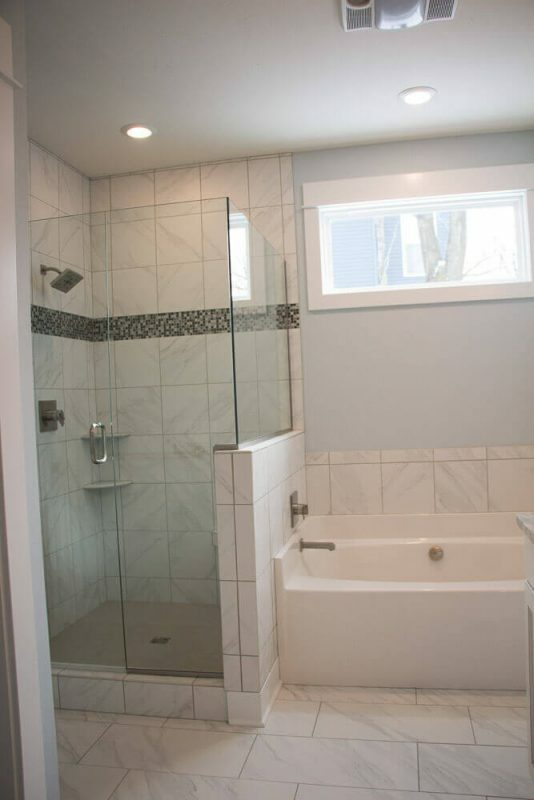 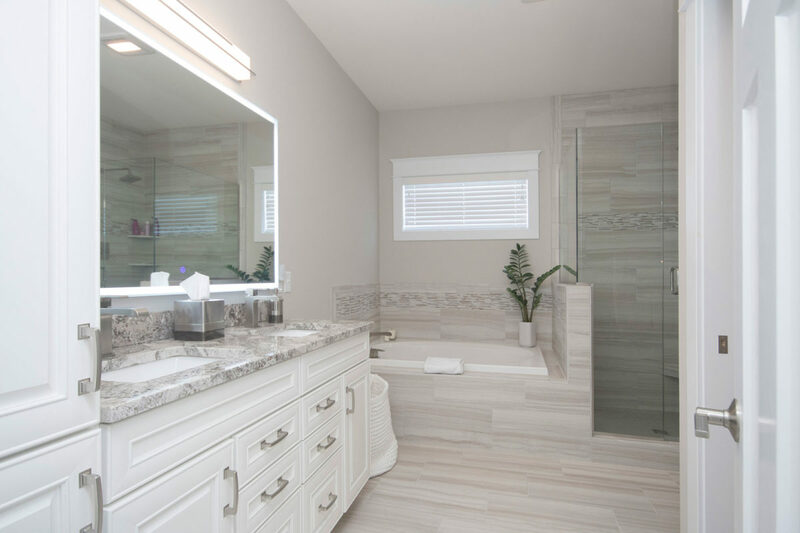 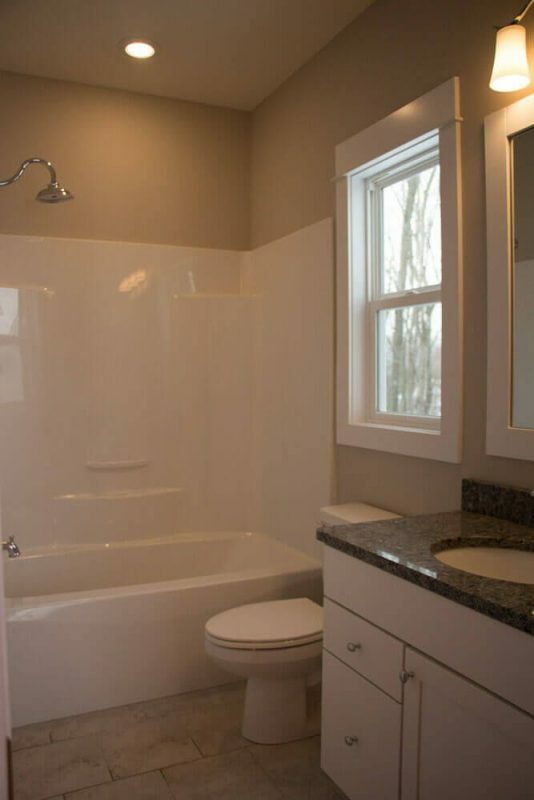 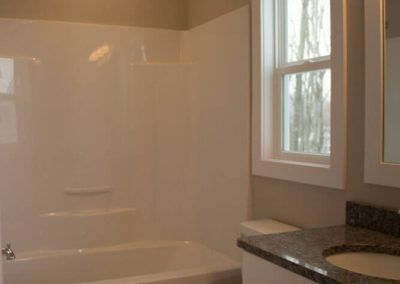 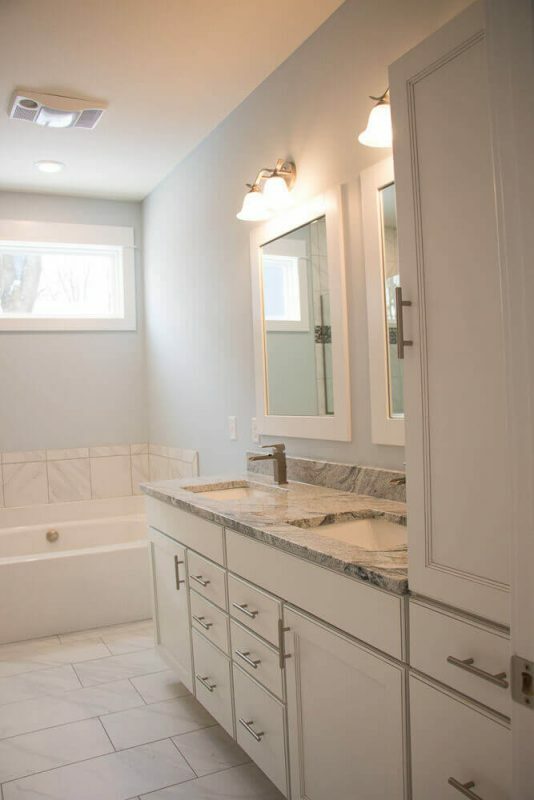 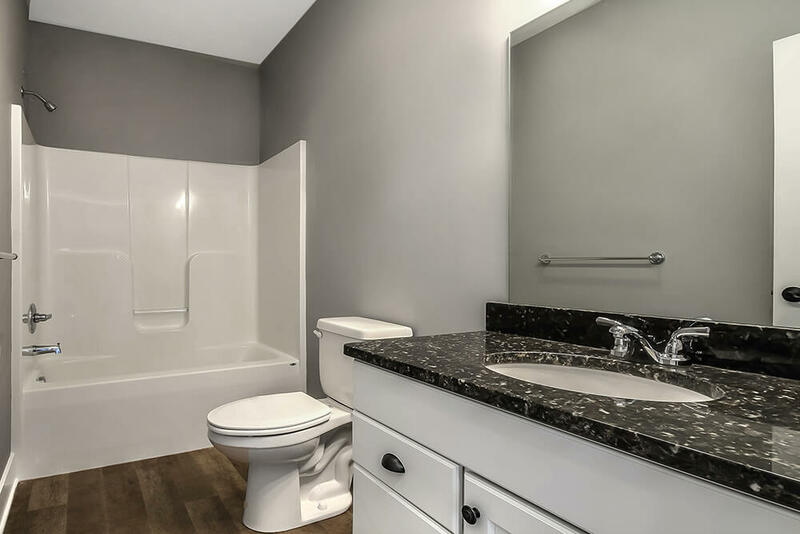 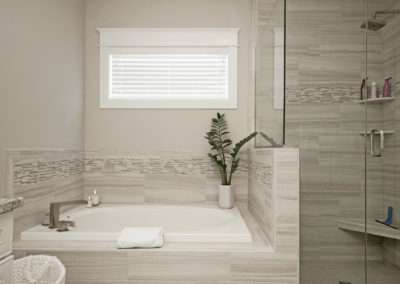 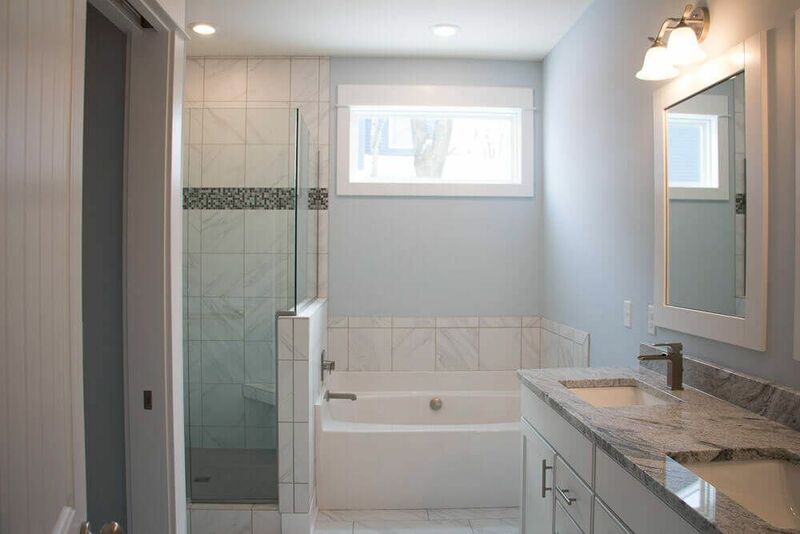 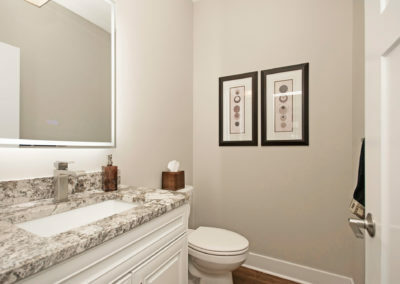 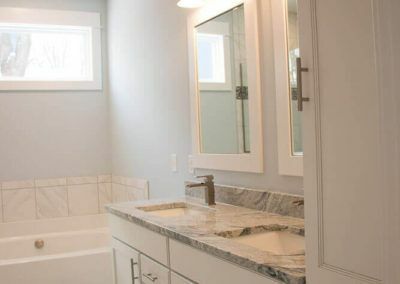 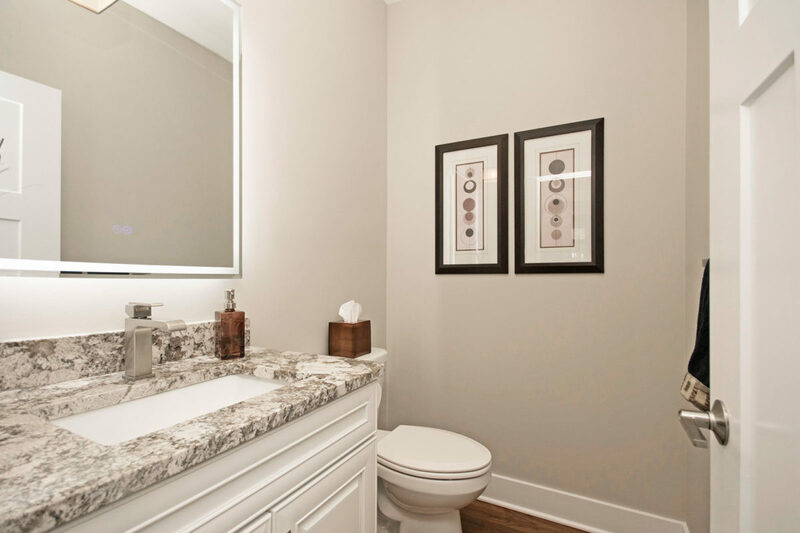 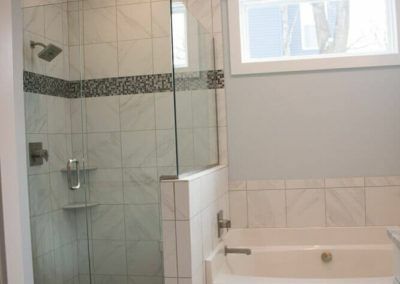 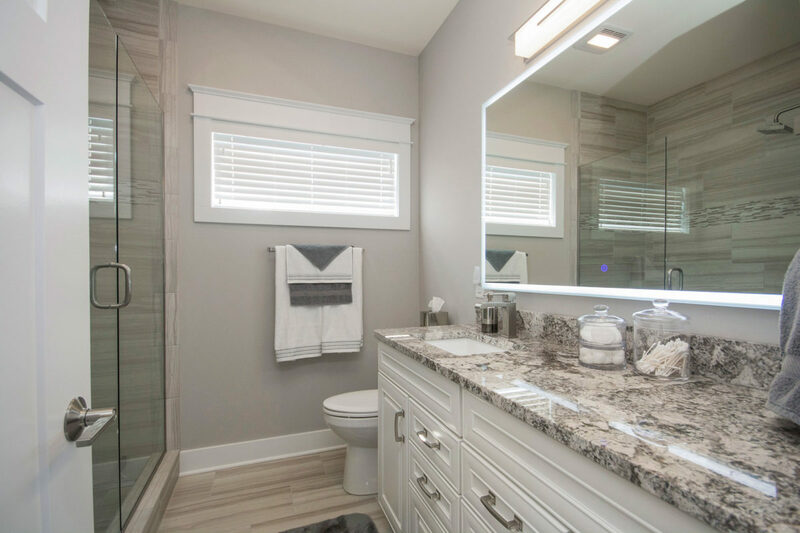 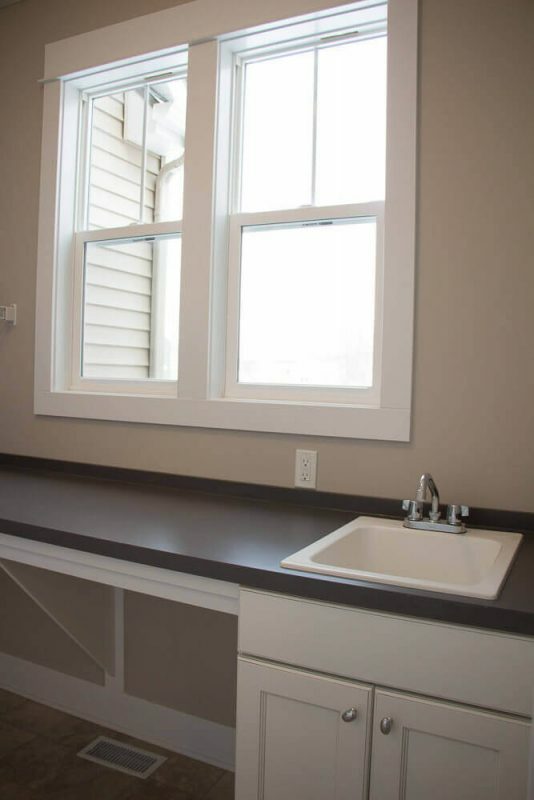 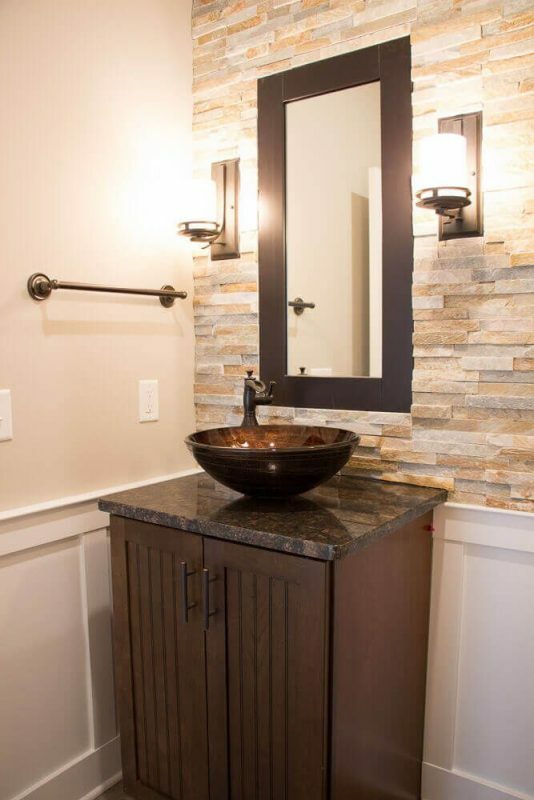 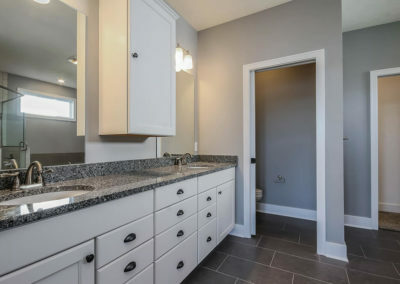 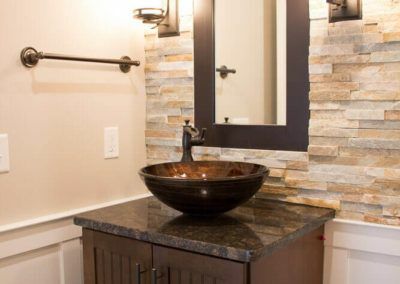 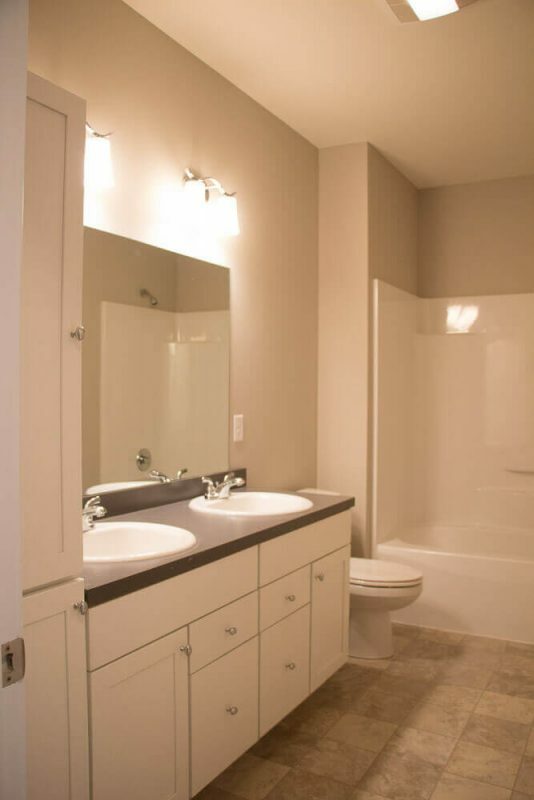 The master bathroom has the option to add a double sink, plus a tile shower or a soaking tub and step-in shower. 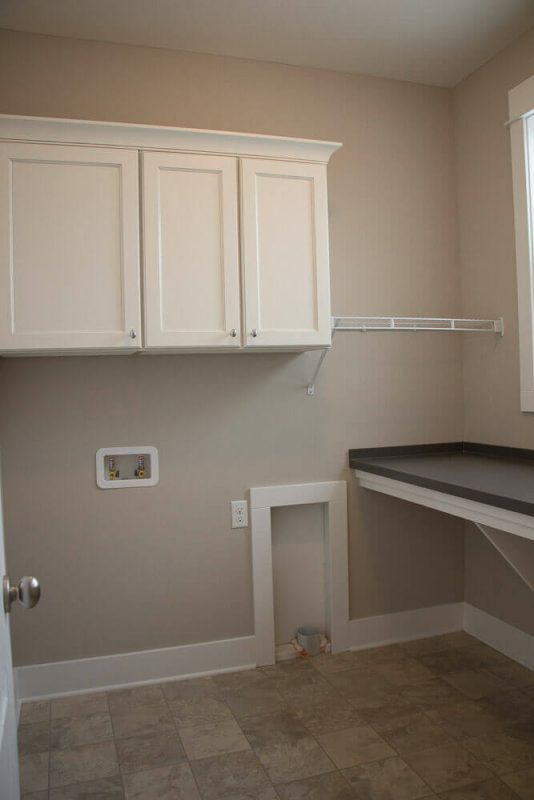 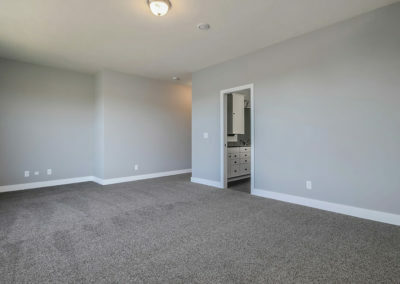 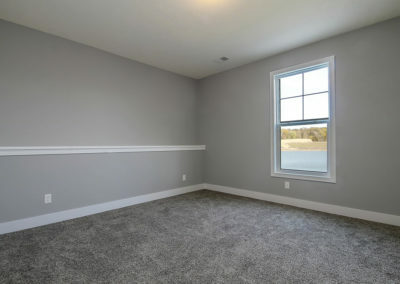 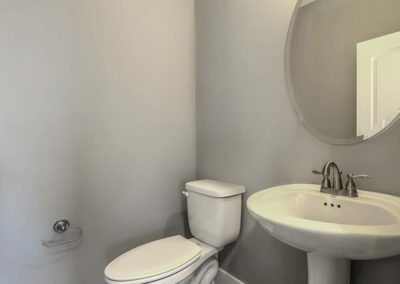 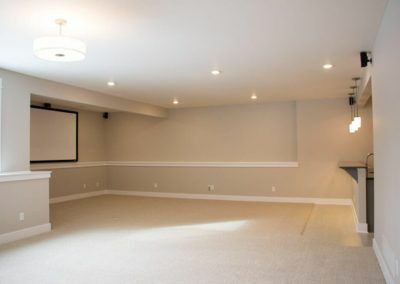 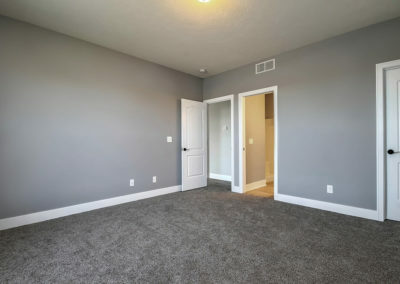 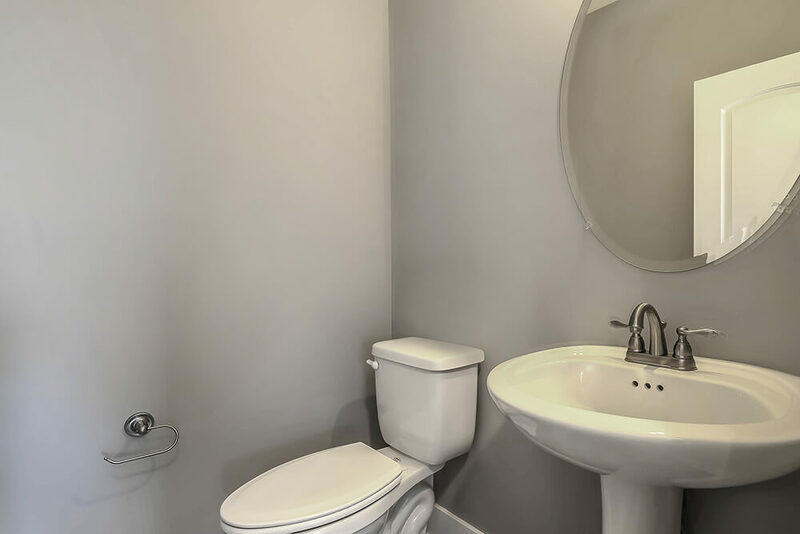 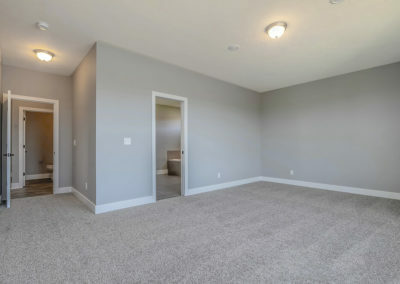 The two other bedrooms are located off a short hall from the family room with an adjacent full bathroom that can be enhanced with another double bowl sink. 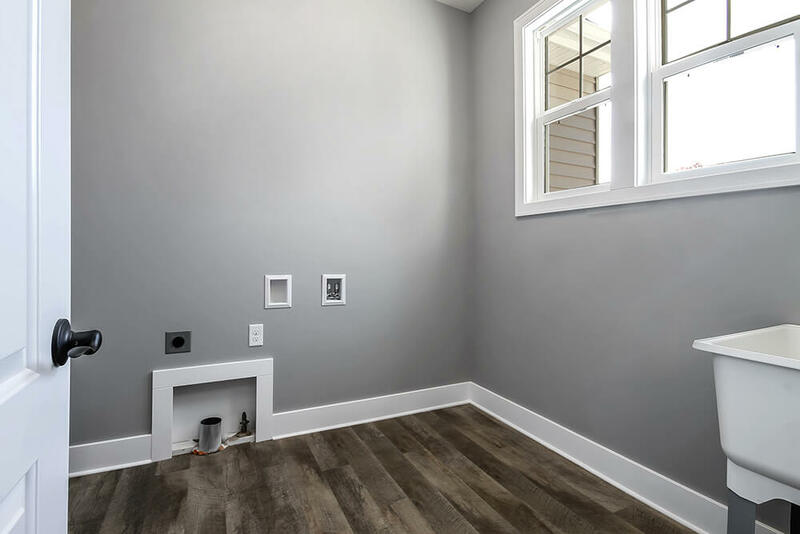 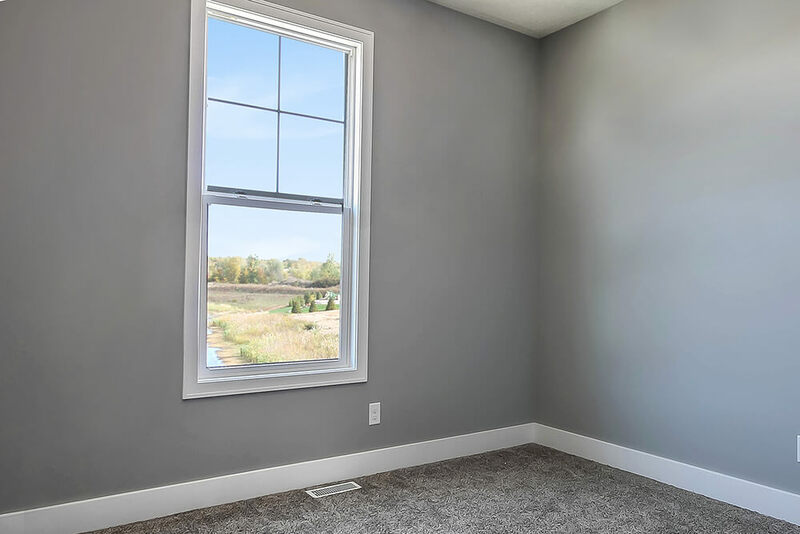 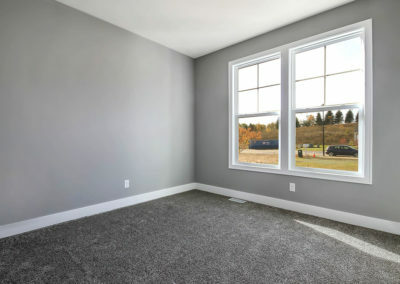 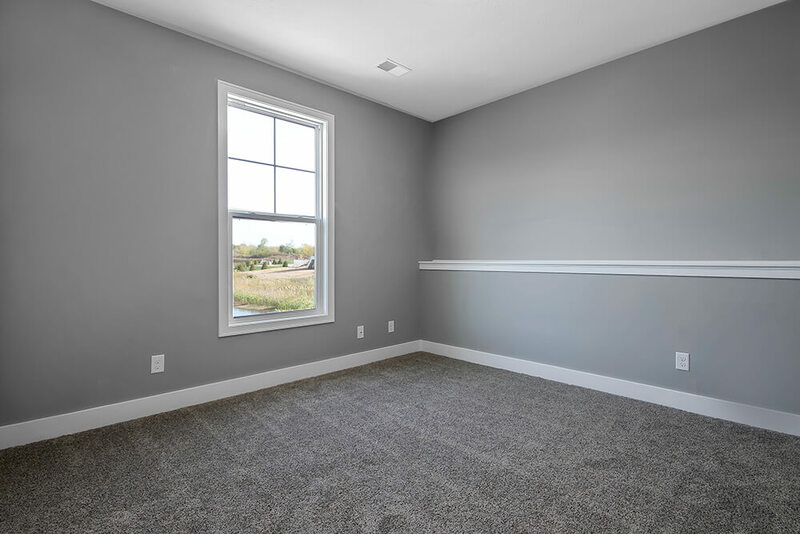 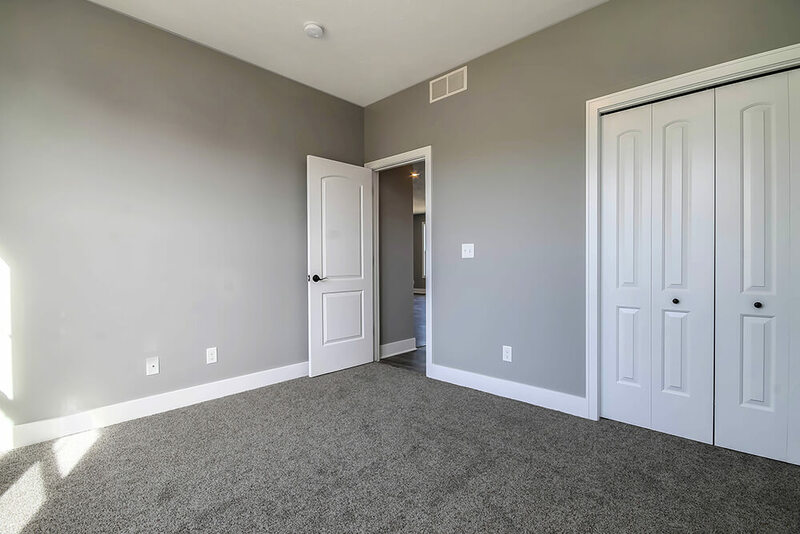 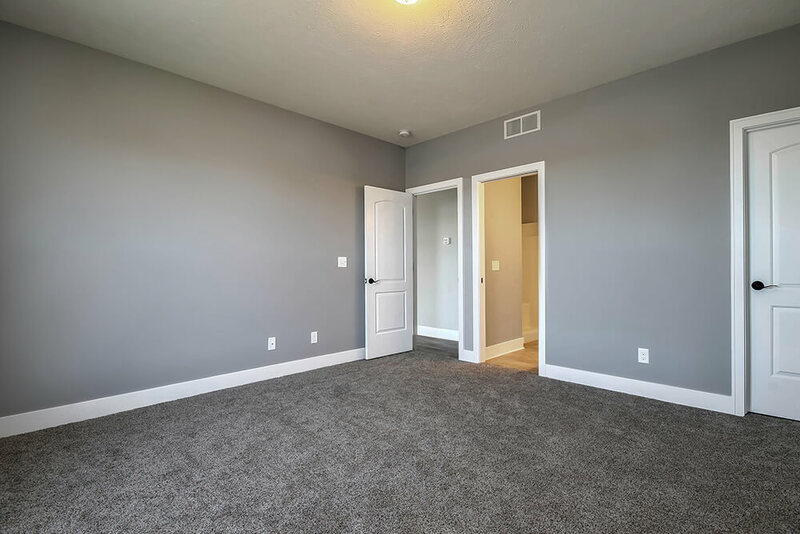 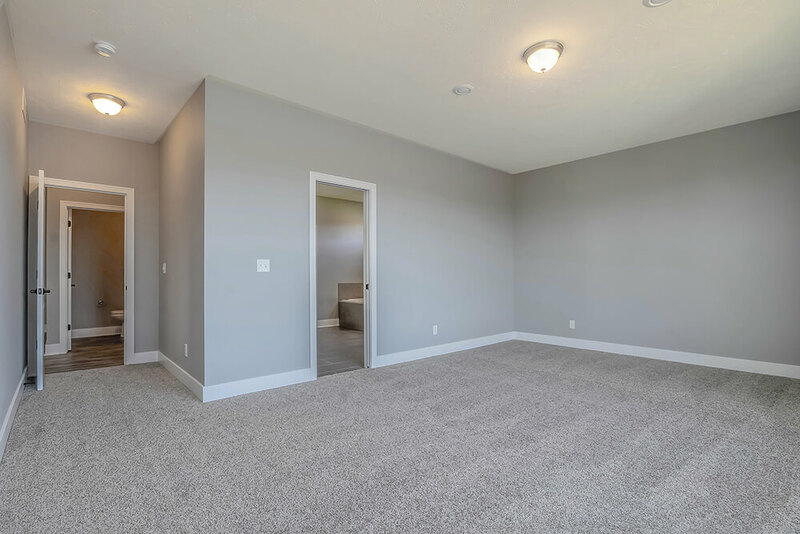 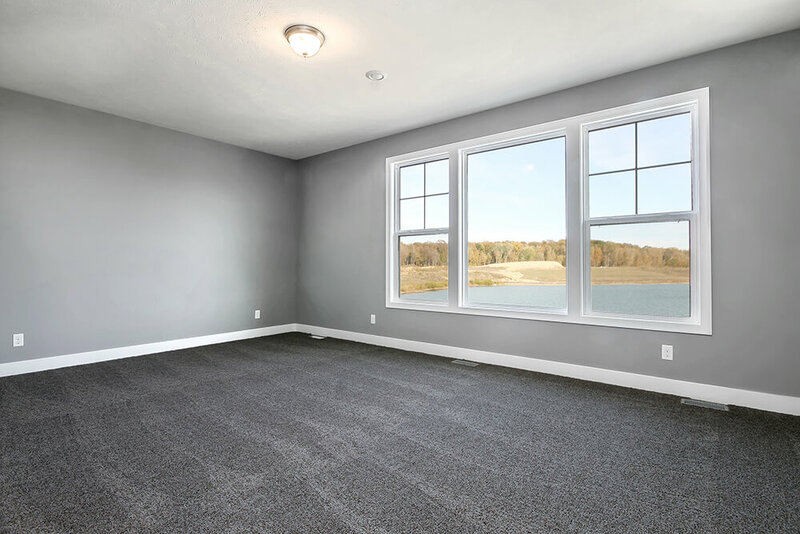 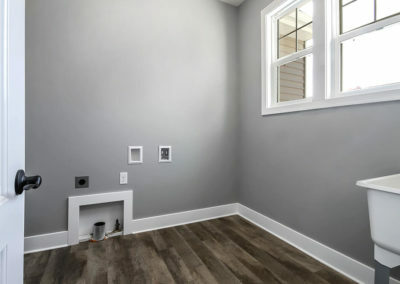 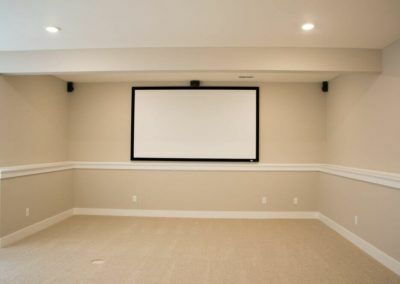 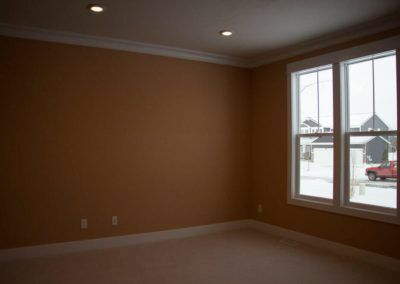 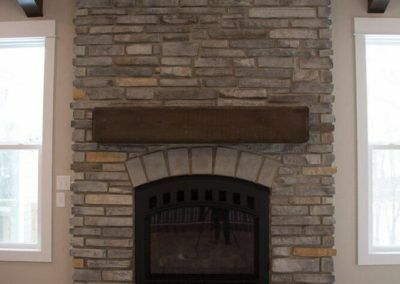 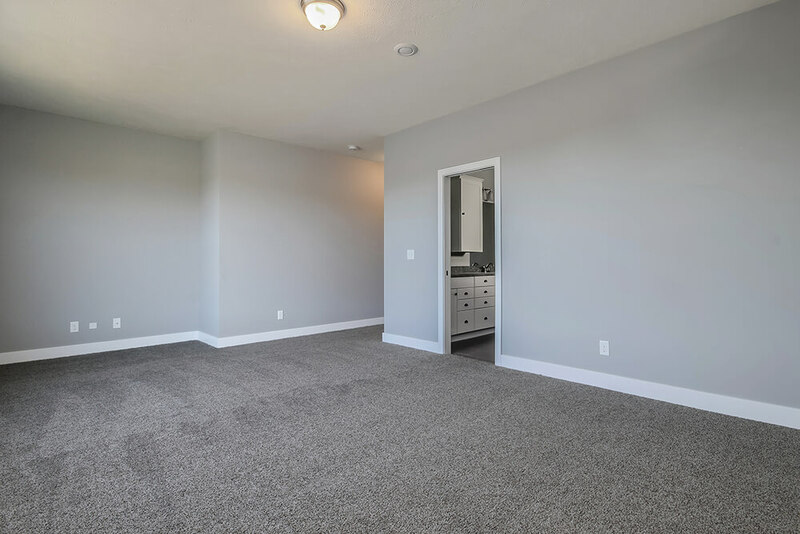 Depending on your needs, one of these bedrooms can be replaced with a warm, sunny hearth room and peninsula fireplace, and the other bedroom can become an office complete with French doors. 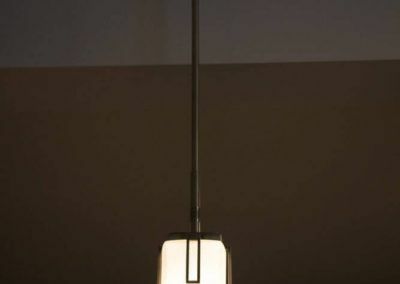 The Fitzgerald’s lower level can be reached through the stairway in the entry hall. 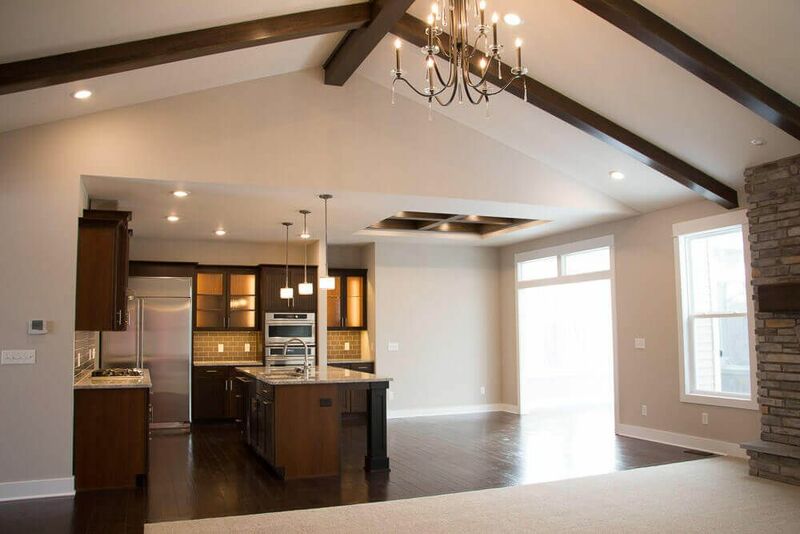 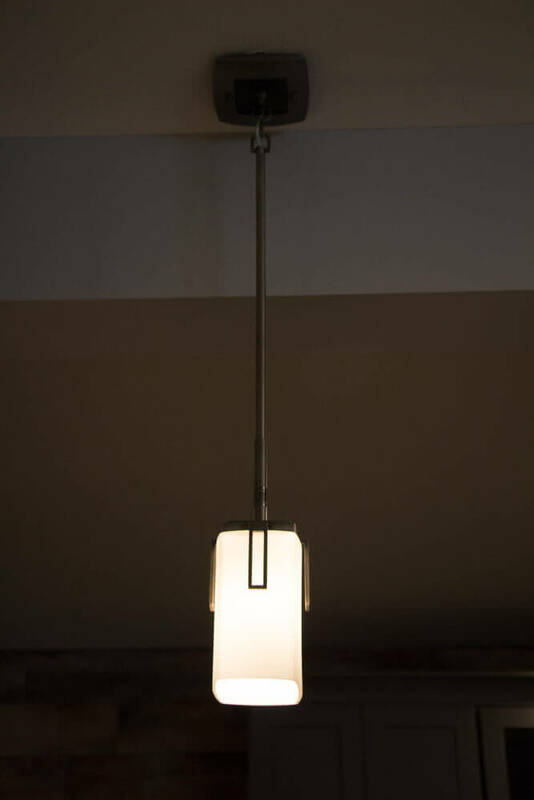 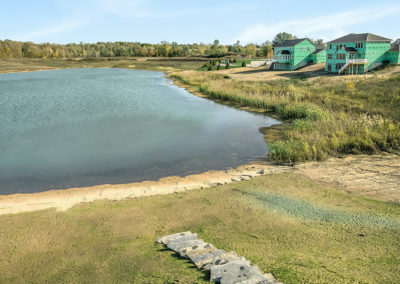 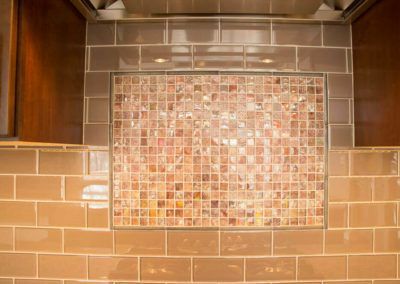 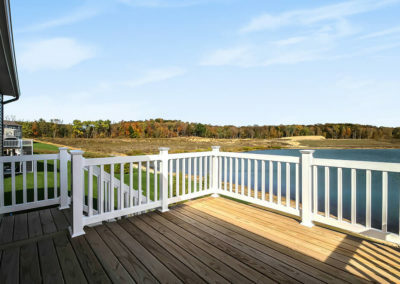 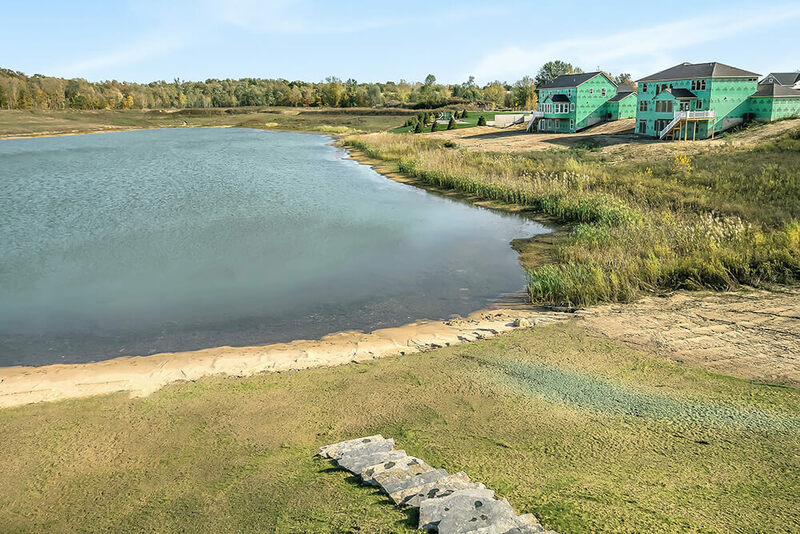 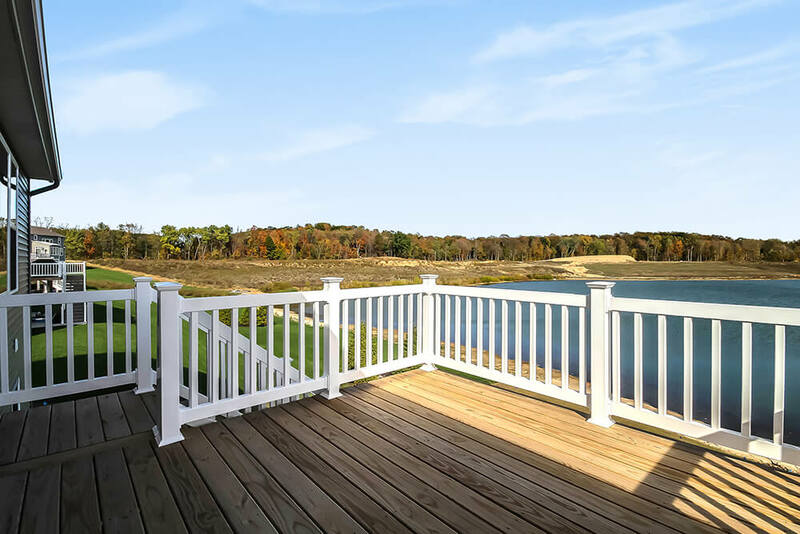 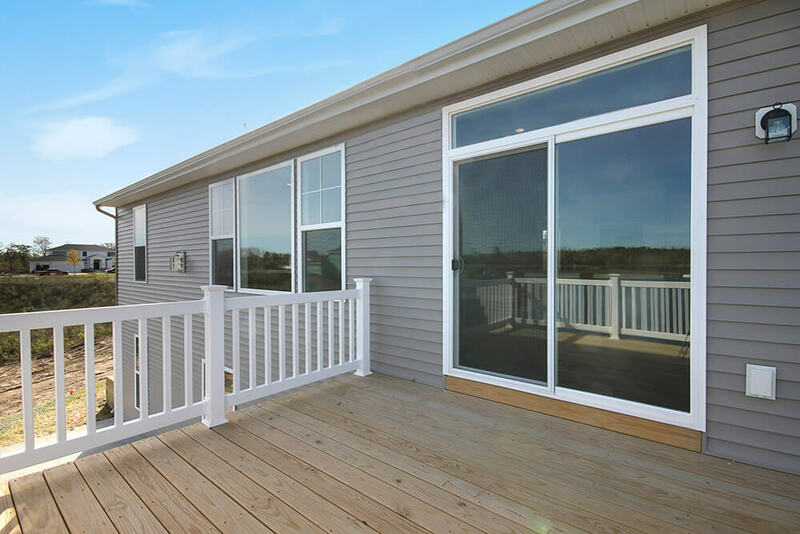 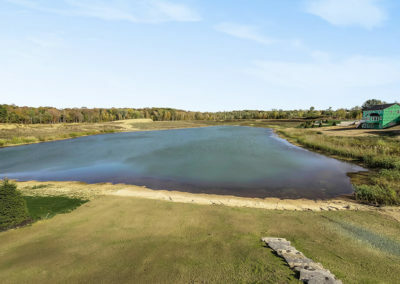 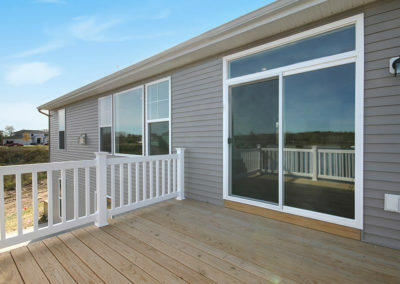 The lower level can be left unfinished or built out with an array of options to suit your lifestyle and home site. 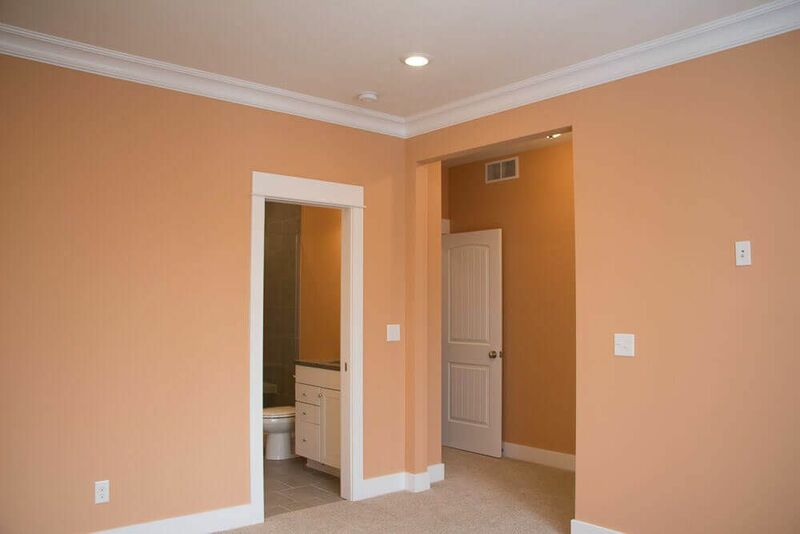 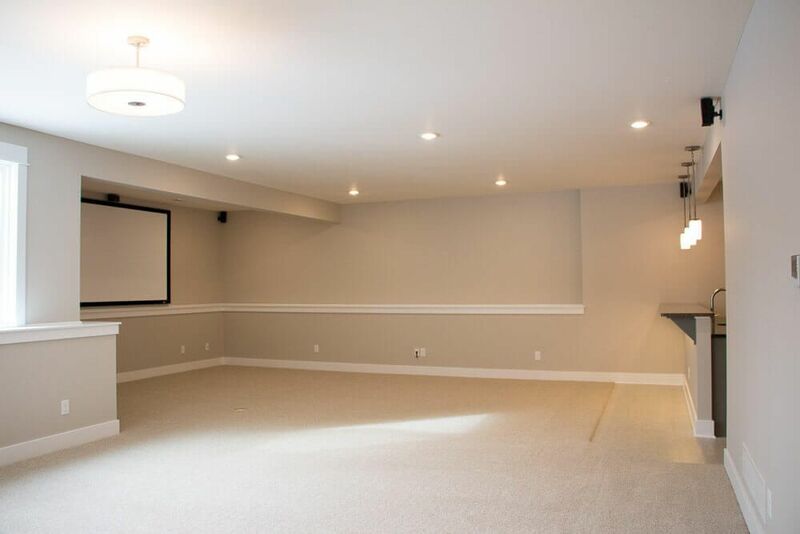 The finished lower level options include a rec room with optional kitchenette, a full bath, and additional bedrooms. 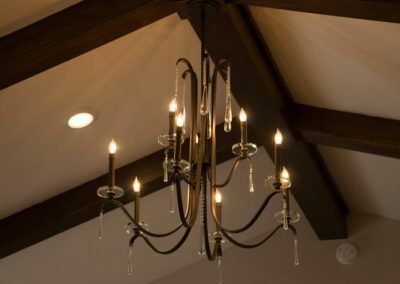 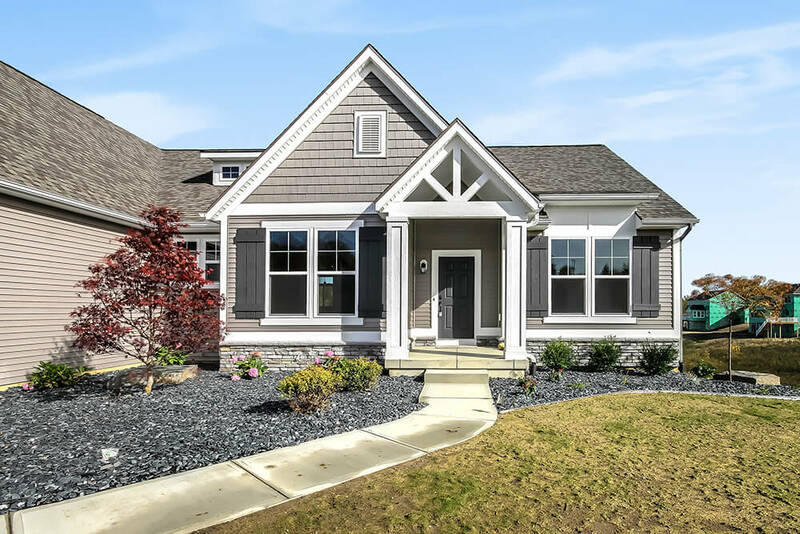 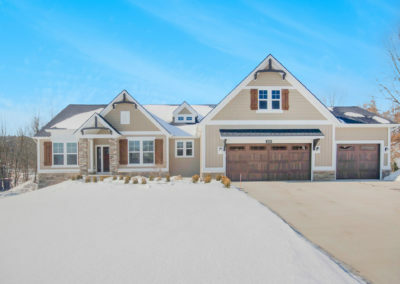 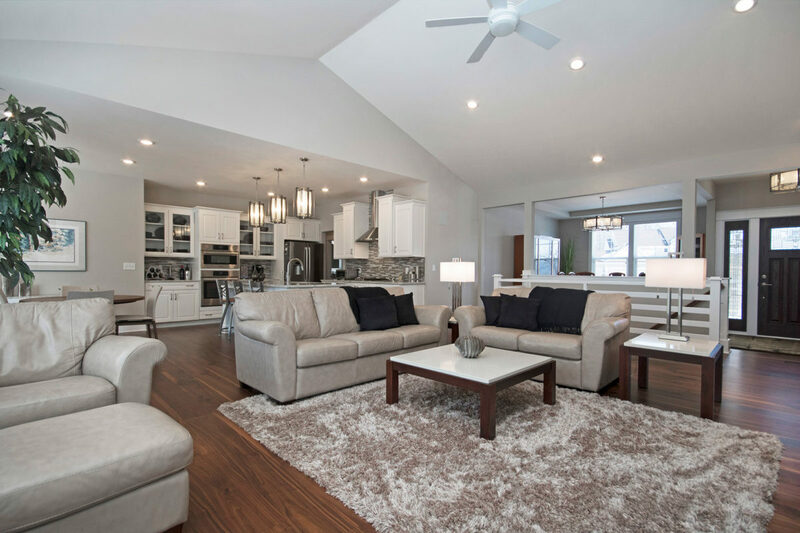 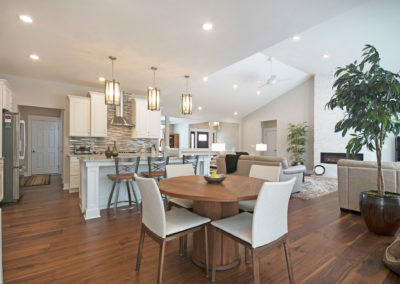 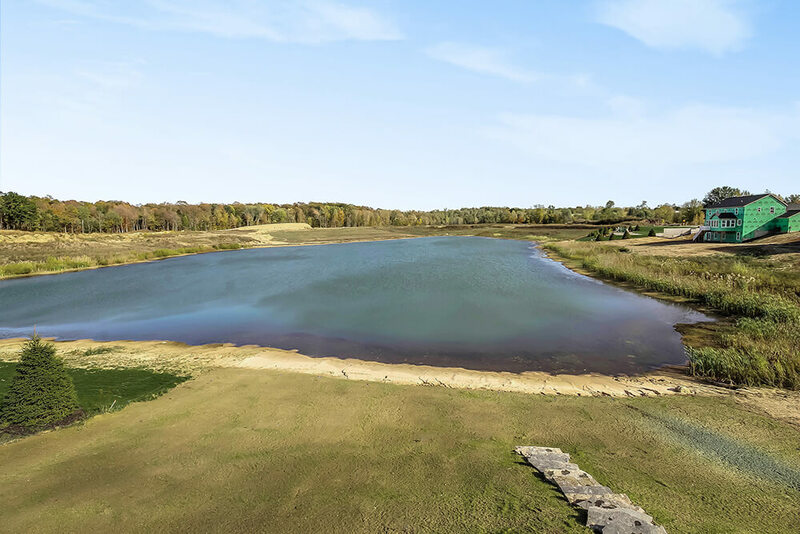 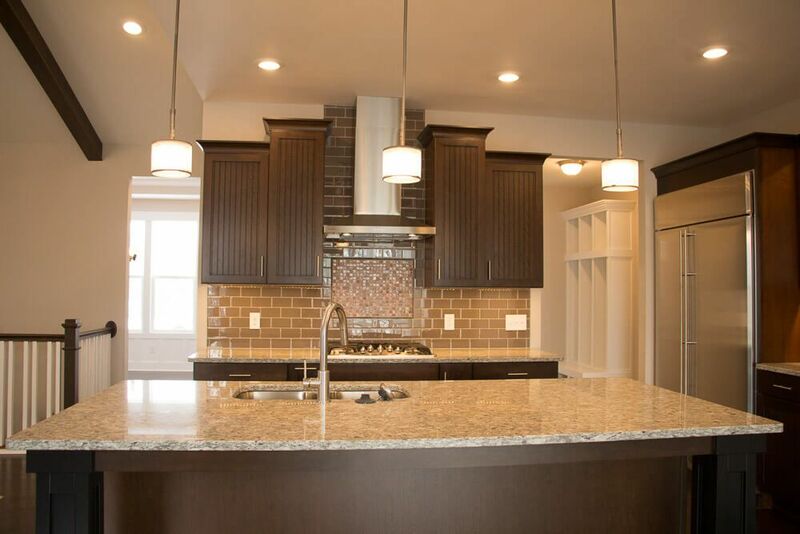 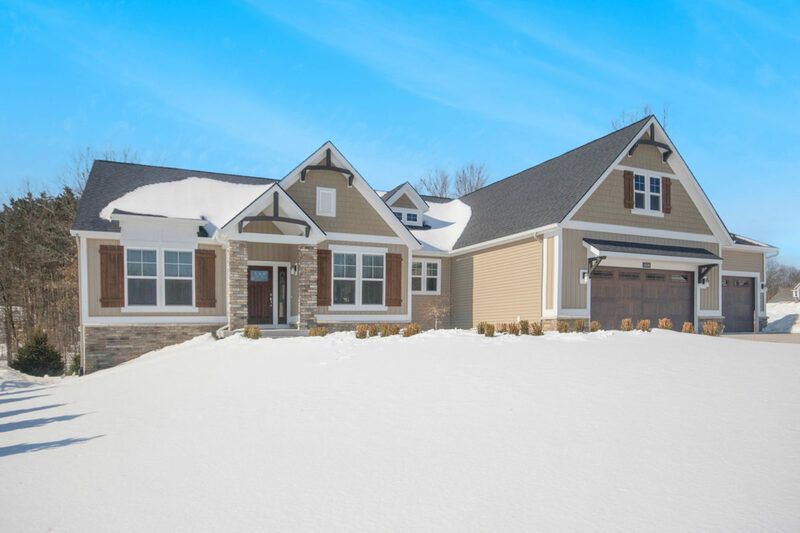 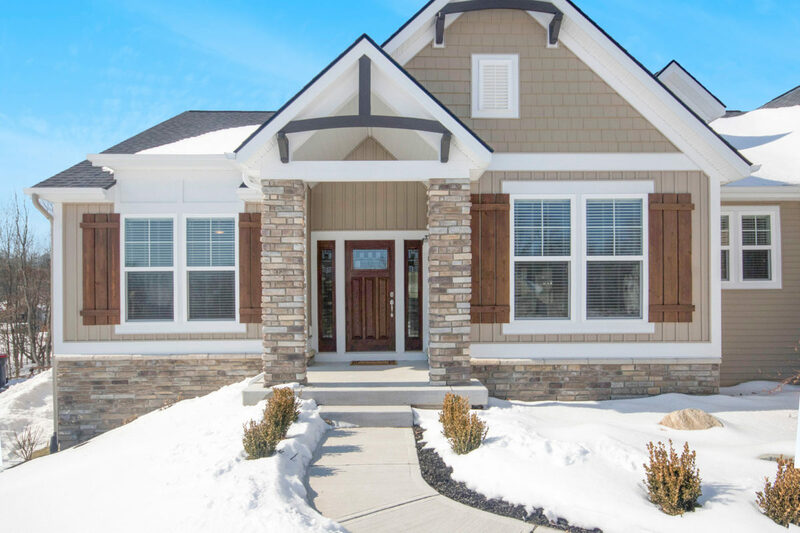 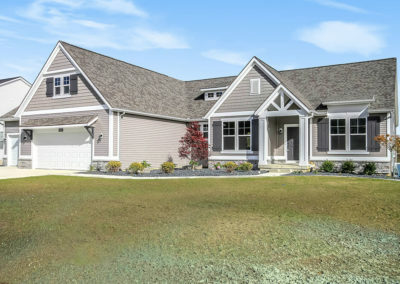 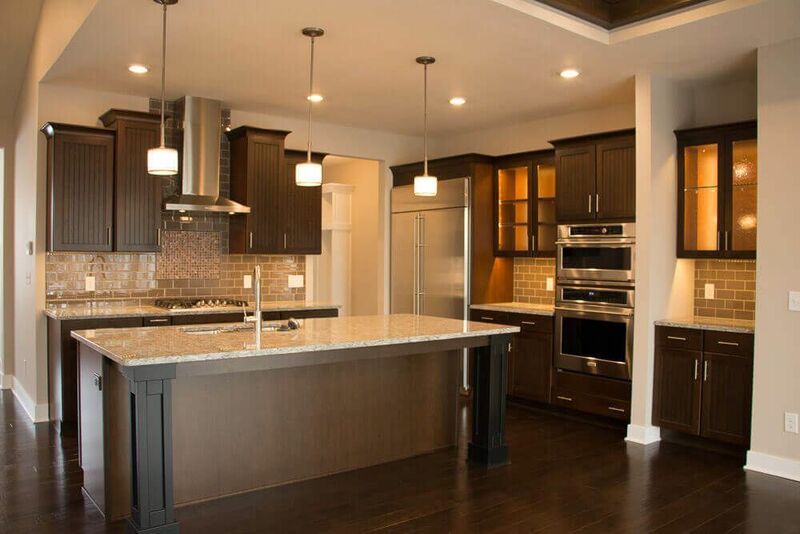 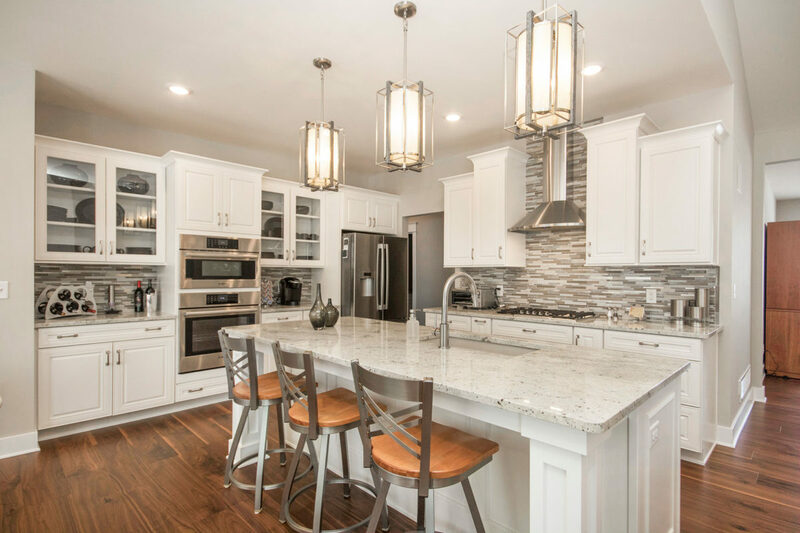 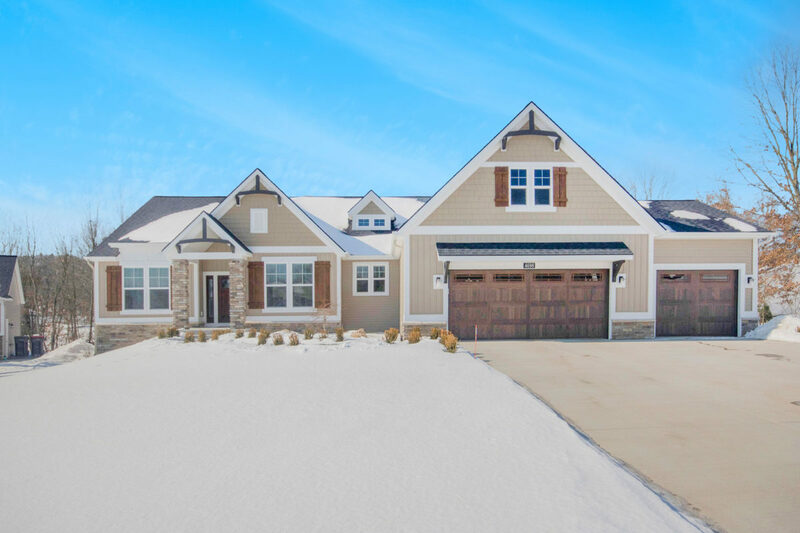 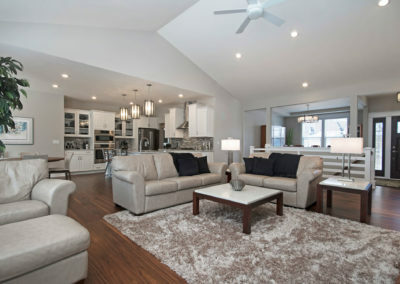 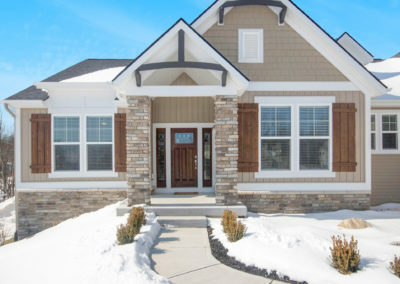 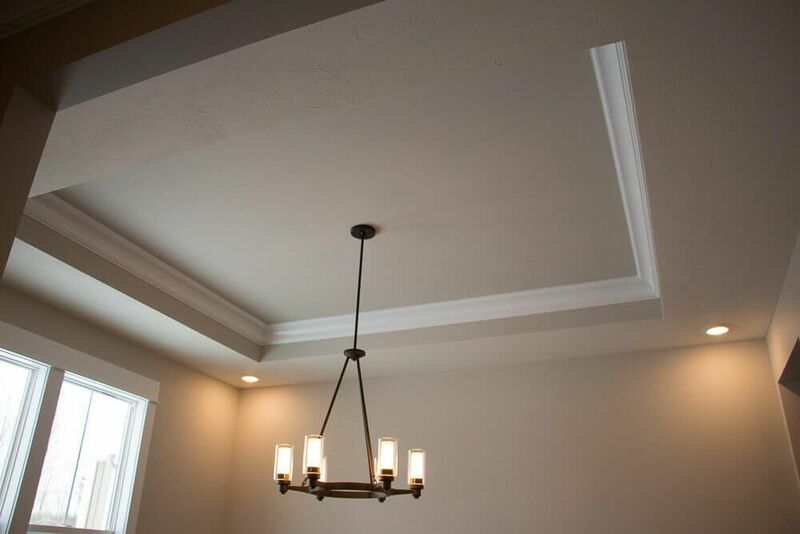 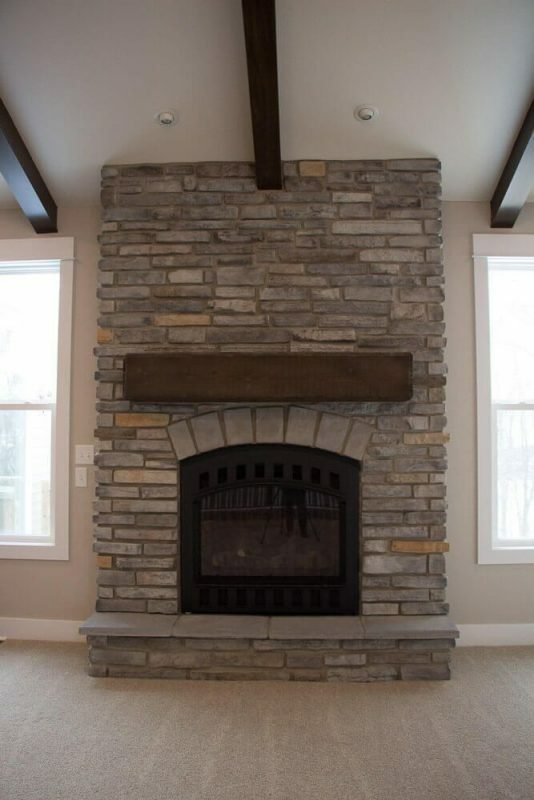 With many options to choose from, the Fitzgerald home plan gives you the room to create a personalized home design built to Eastbrook’s highest standards. 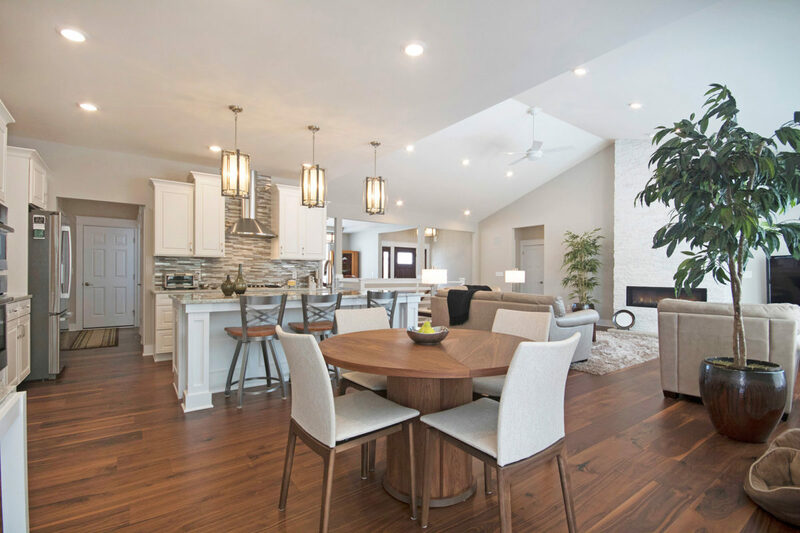 With timeless appeal, lasting value, and energy efficiency, your new Fitzgerald house will be the perfect home for you and your family.